Click on the RED hotspots and then on the photos to go back. 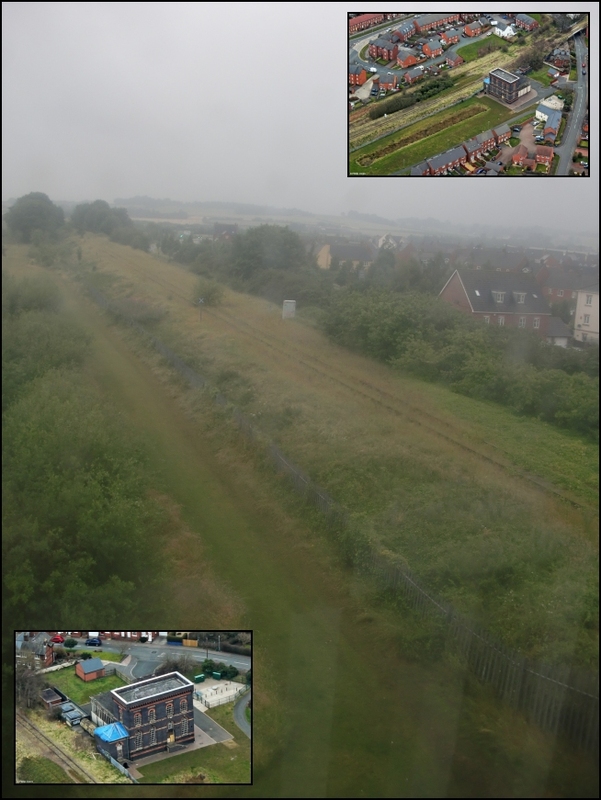 The photos show the track before we started late 2017 and will be updated in Spring 2019. 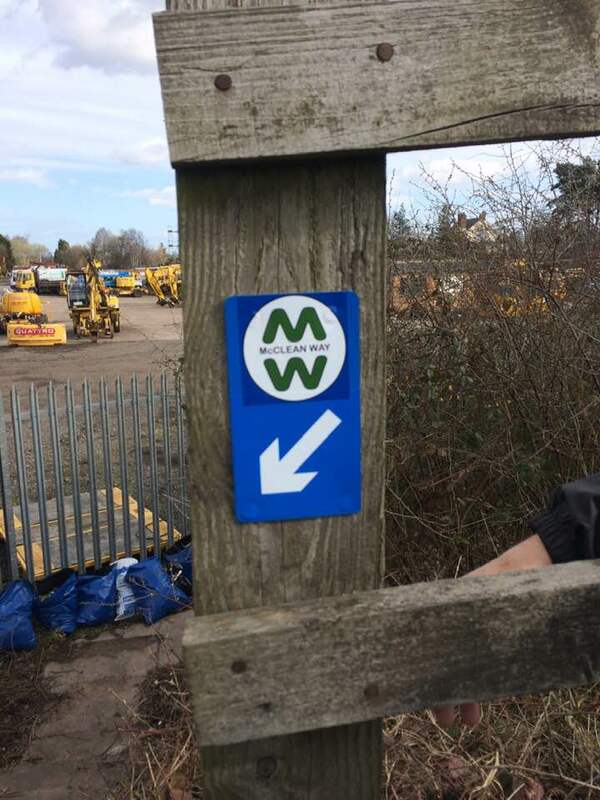 "A greenway is a corridor of undeveloped land, reserved for recreational use and environmental conservation"
For a long time we felt the disused railway between Walsall and Lichfield should have a name like many other well known routes around the country and so we are really pleased to be told officially we can now call it "McClean Way" with this logo as a suggested way marker. 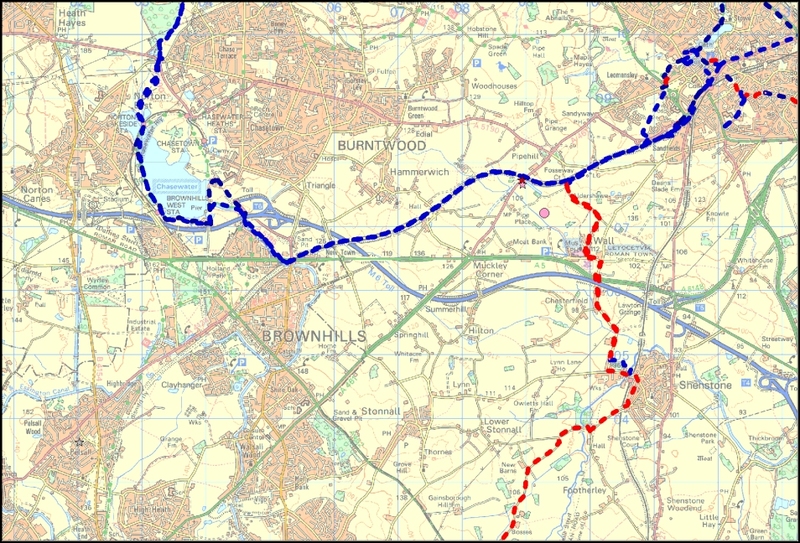 in establishing both the South Staffordshire Railway and the Water Pipeline. 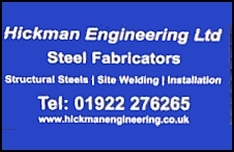 Just to say a very big "Thank You" to all our sponsors. 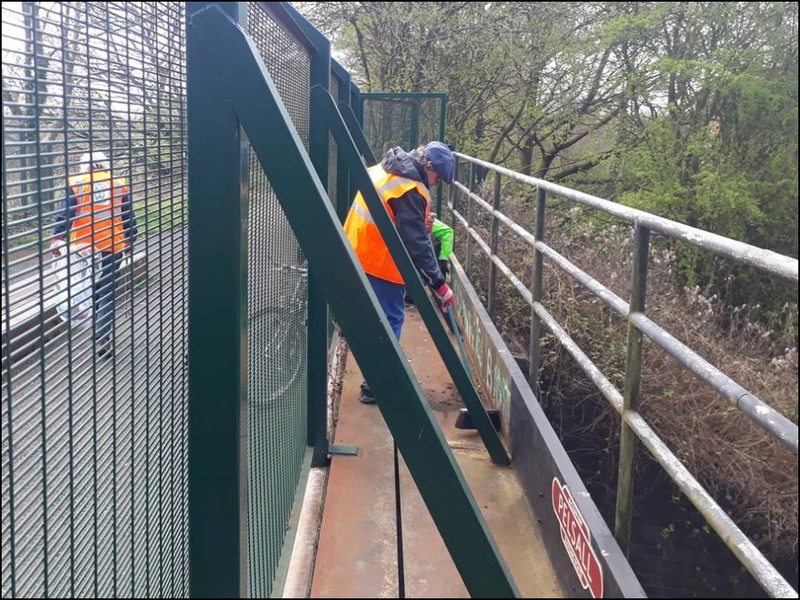 10/04/19 Tidy up the Vicarage Road Bridge before covering up the garffiti. 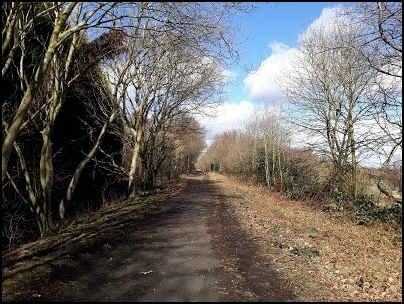 01/04/19 Looking towards the A5 with the track drying out, waiting for the leaves to appear. 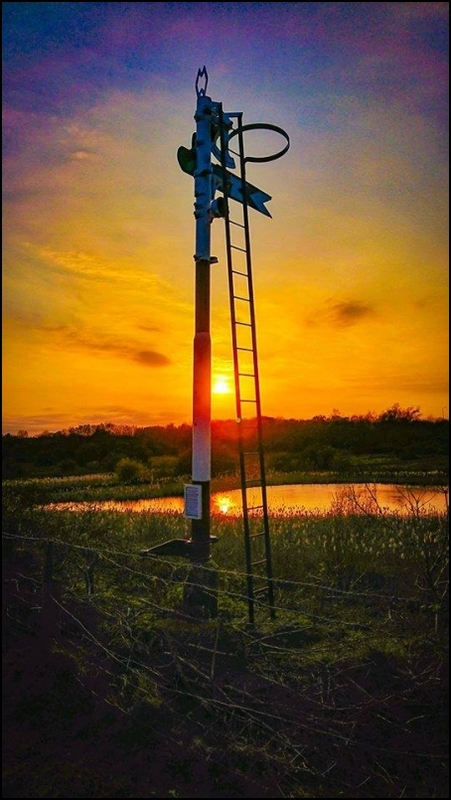 Thank you to Martyn Arrowsmith for this stunning photo of the signal at sunset. 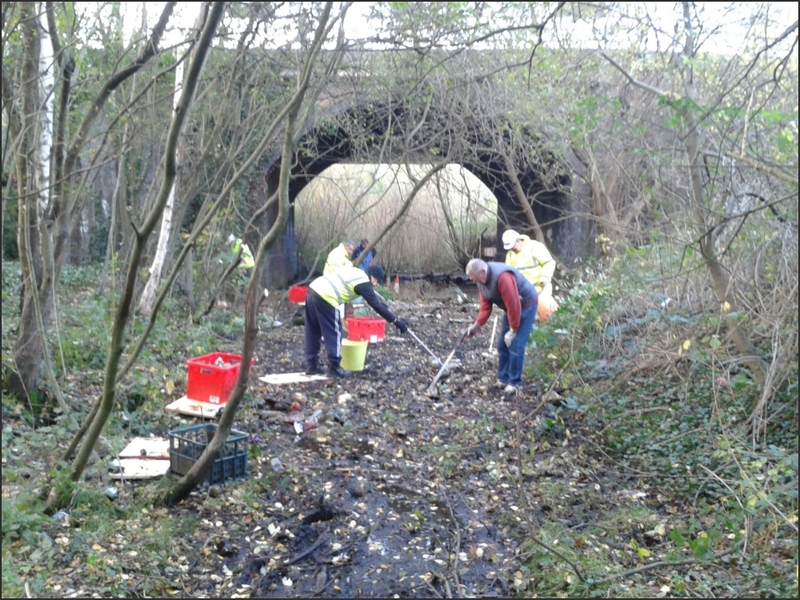 Not just extending but maintaining and enhancing with nearly 200 bulbs planted. 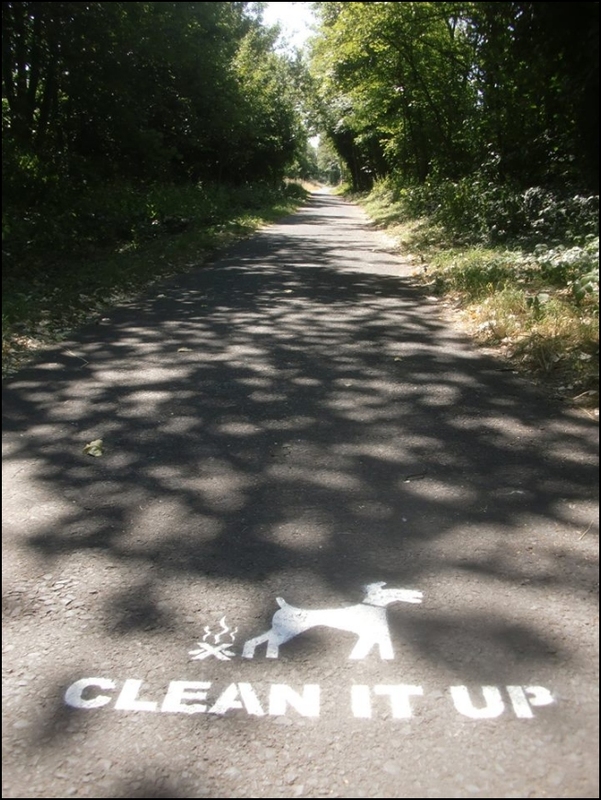 The 'McClean Way' signage going up along the track. 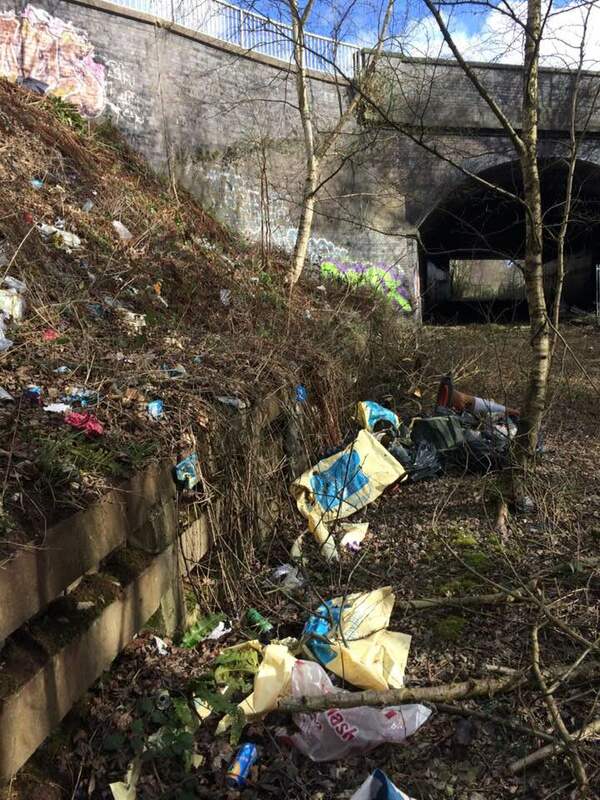 Rubbish to be collected between the canal aqueduct and the A5 Bridge. 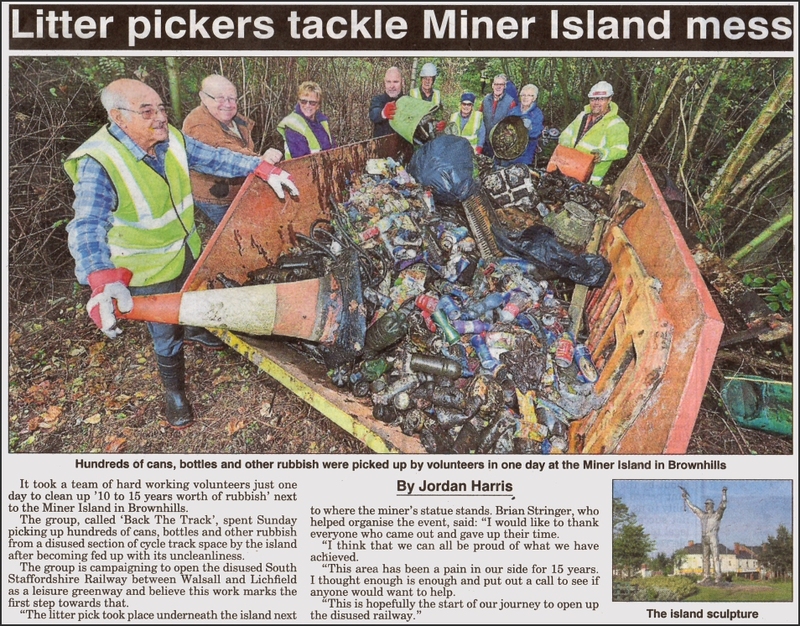 We made the local papers again. 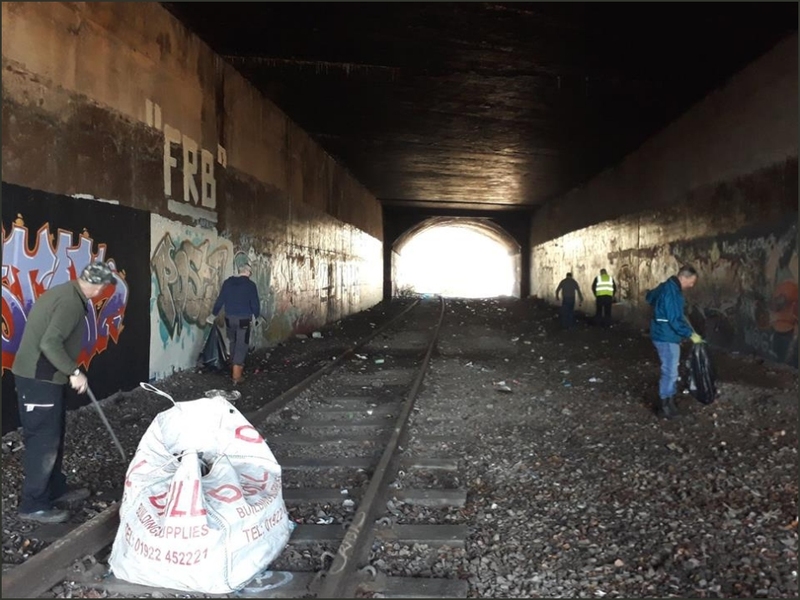 Some before and after photos taken by the canal bridge. 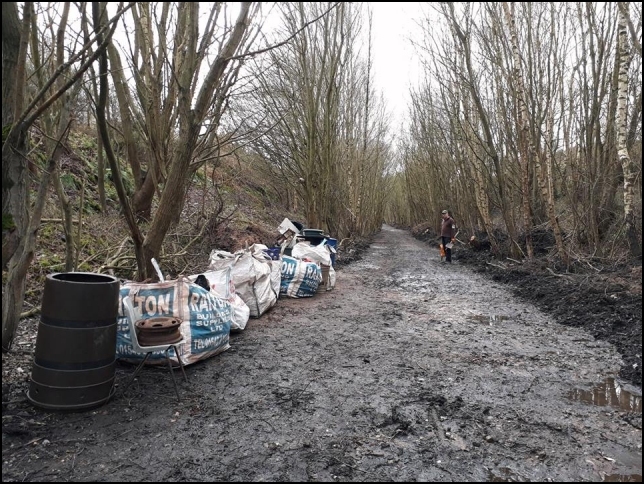 Now we have had it confirmed that the stretch we look after ends just north of the A5 bridge (and not the canal as we originally thought) the team were out clearing under it plus filling the skip by Smithy's. 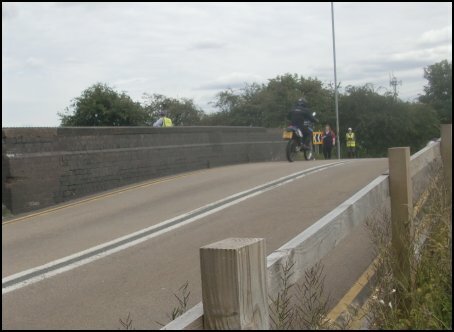 Thanks to a generous donation from Mike Rhodes we now have replica signs on the Vicarage Road bridge. 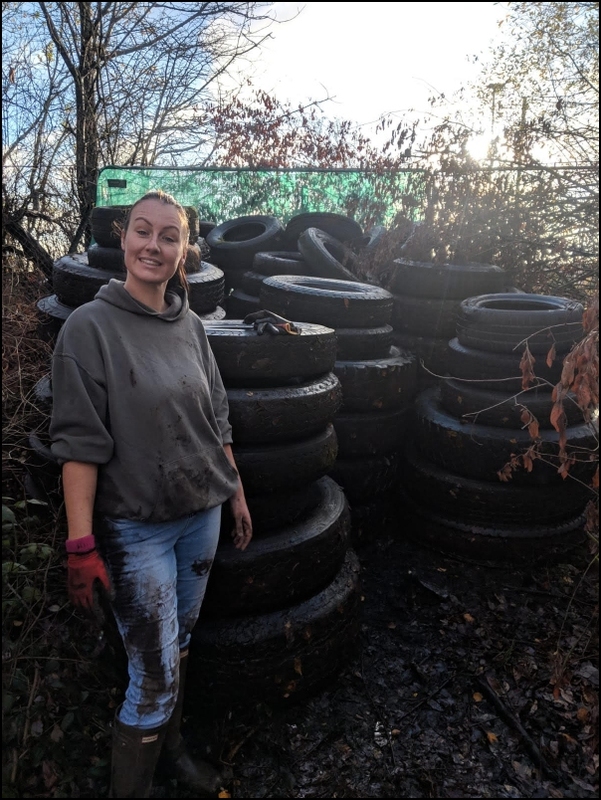 The team have been hard a work collecting rubbish and tyres towards the A5. 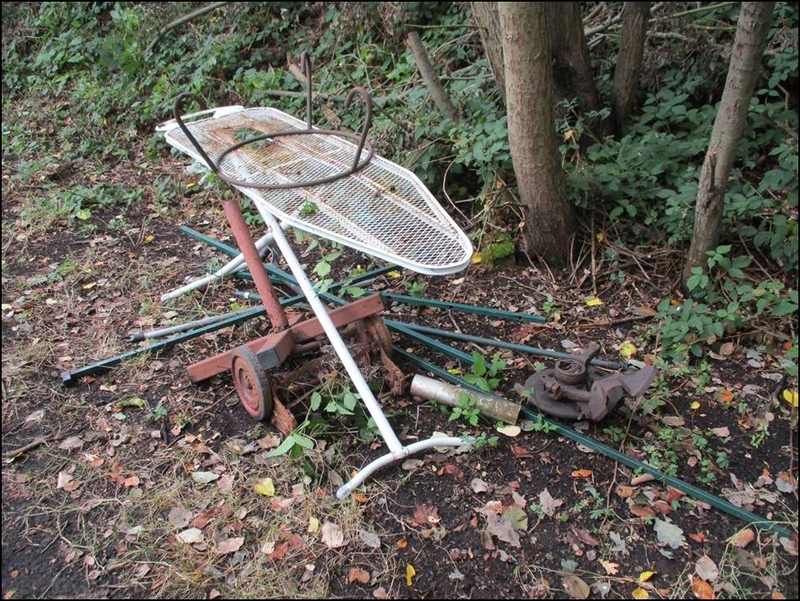 Carl saved us hours of back breaking work up to Smithy's ready for the skip. 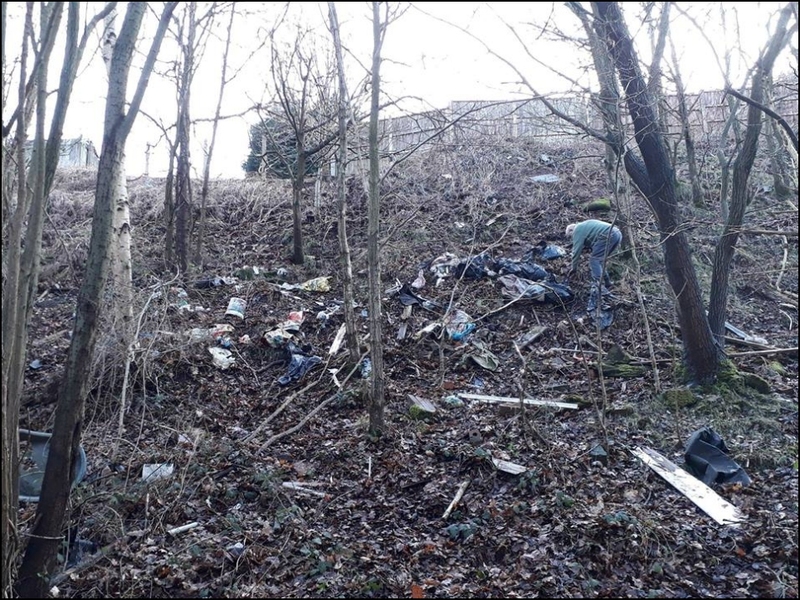 Now to start clearing the years of rubbish thrown onto the track to the north of Brownhills. 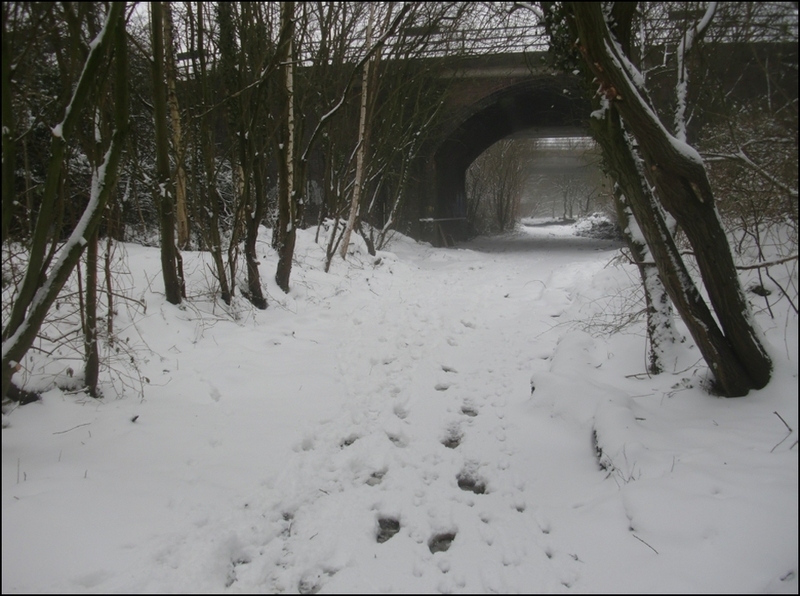 The canal bridge is in sight and easily accessible from Brownhills. 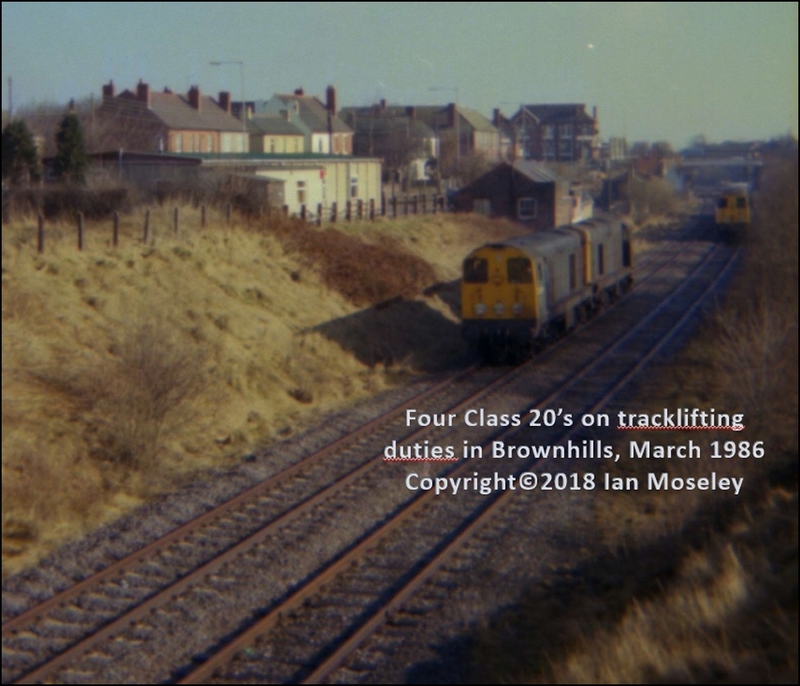 Brownhills Station as it appeared in .....? 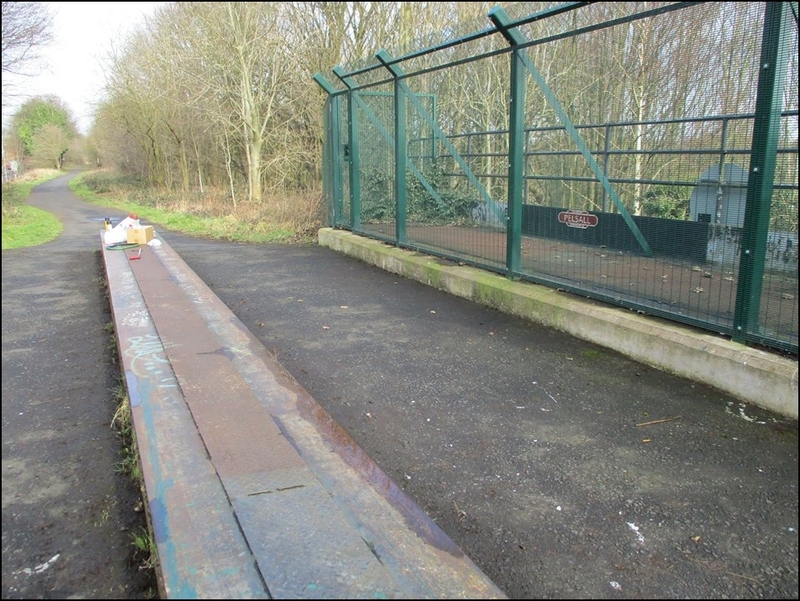 Due to the unauthorised removal of the posts at 'The Swan' end we have replaced them temporarily with something we hope will stop unwanted access but still allow walkers and cyclists to get through. 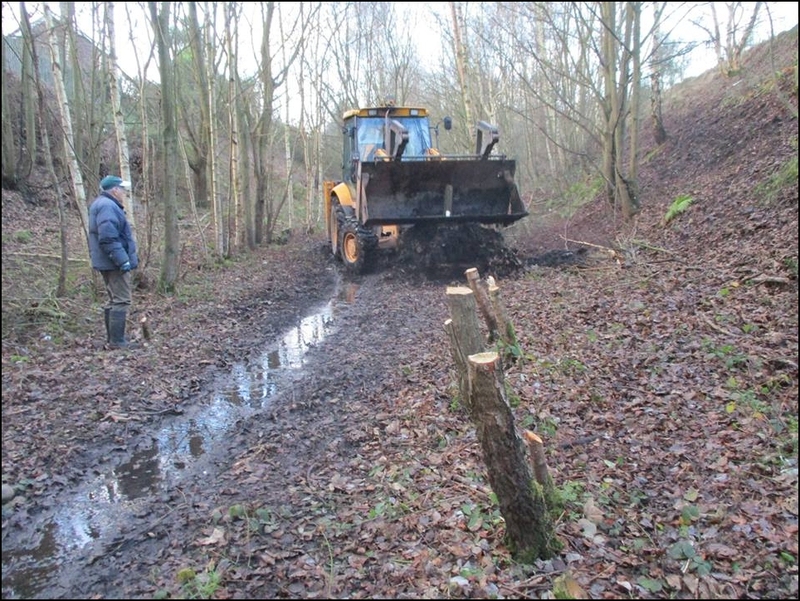 Carl removing stumps to get to the dam. 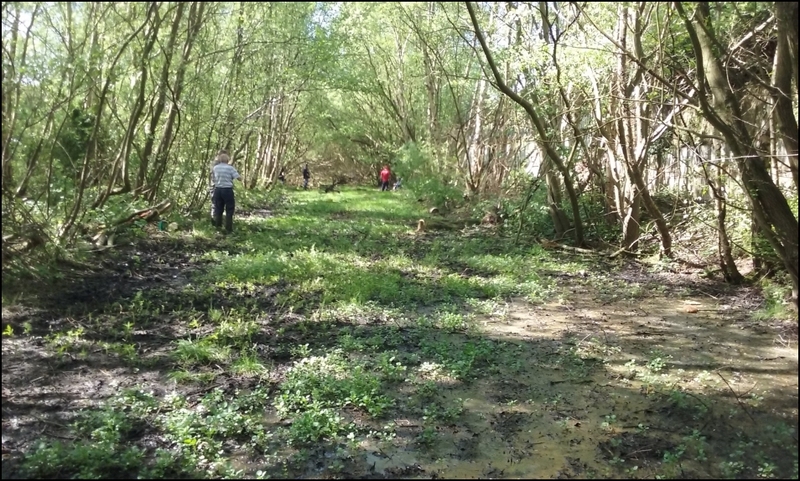 Working through the dam and to think we considered removing it by hand! 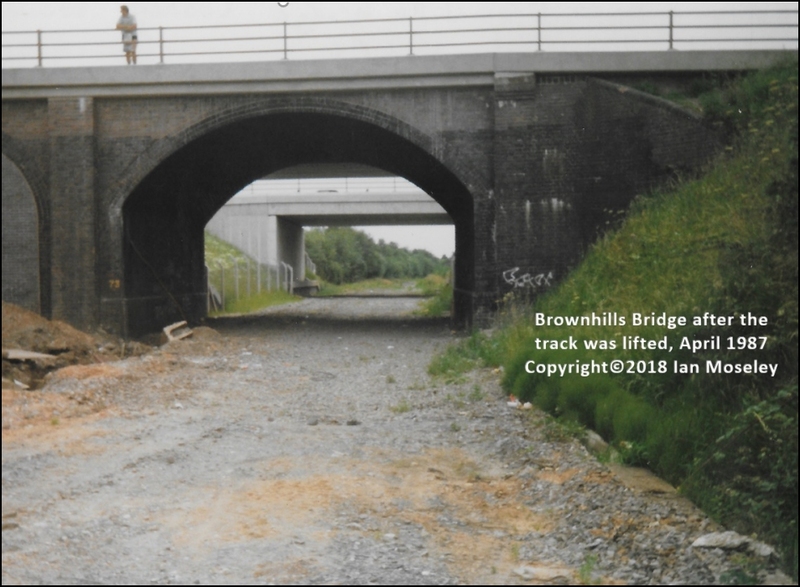 Looking towards the A5 from the Brownhills direction at where the lake used to be. Most of the BTT team are putting their feet up this week for a well deserved break but rest assured they will be back in action in 2019. 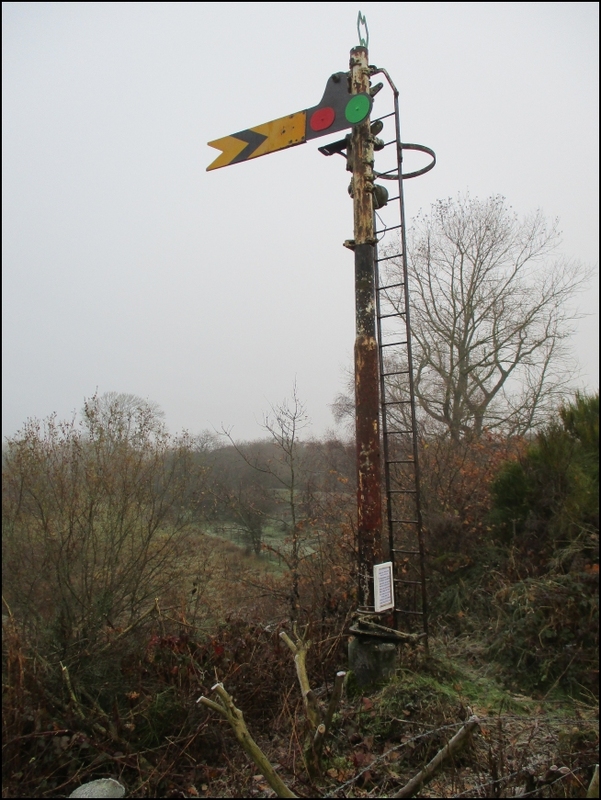 If you are looking for somewhere to walk of the excesses of the festive season the McClean Way beckons. 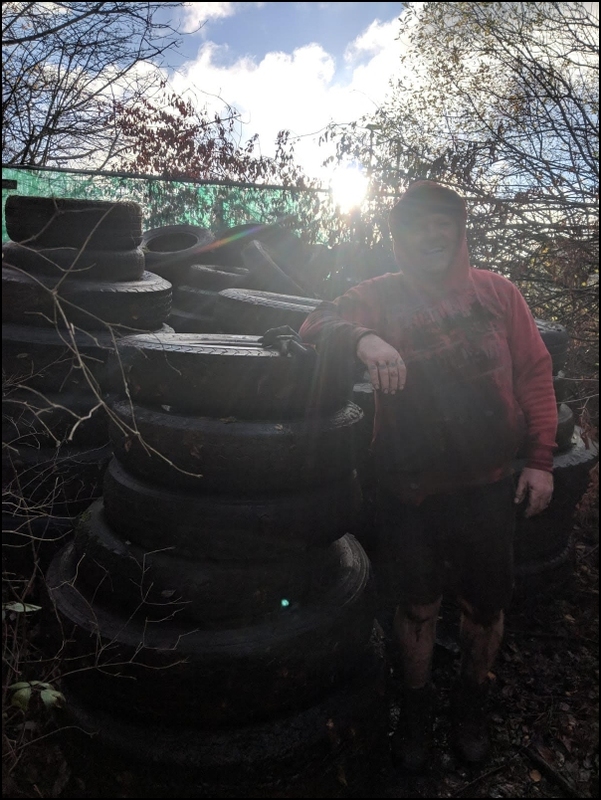 "If you go down on the track today you're sure of a big surprise" Brian and Barry were on the Brownhills section of the McClean Way on Friday calculating how long it would take to put all the tyres in a pile to be collected when along came Nicola who asked if she could help? 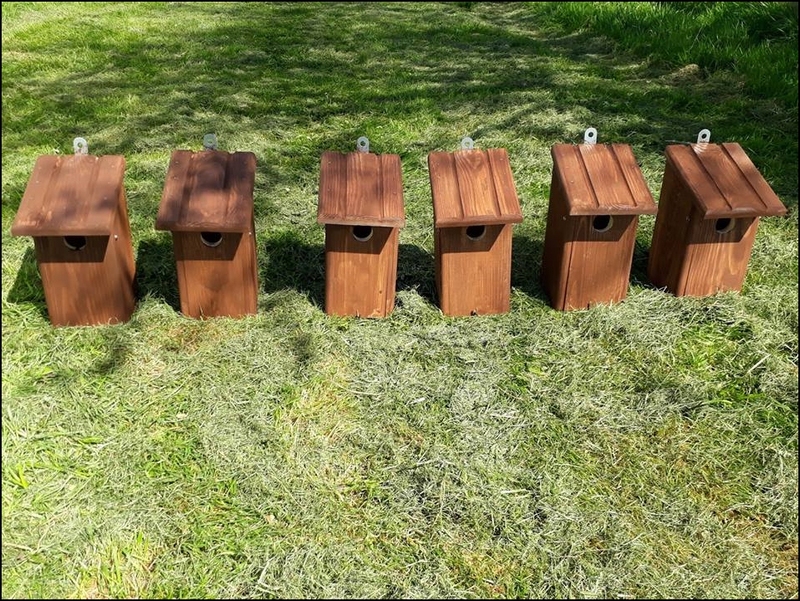 Well we thought we were going to get a team but what we got was Nev who with Nicola's help has got them all in one place in just two mornings! How far he must have walked and how much weight he must have carried we wouldn't like to calculate but it was a phenomenal task. So on behalf of BTT can we say a huge "Thank you" to you both but just wondering what's Brian going to do now? 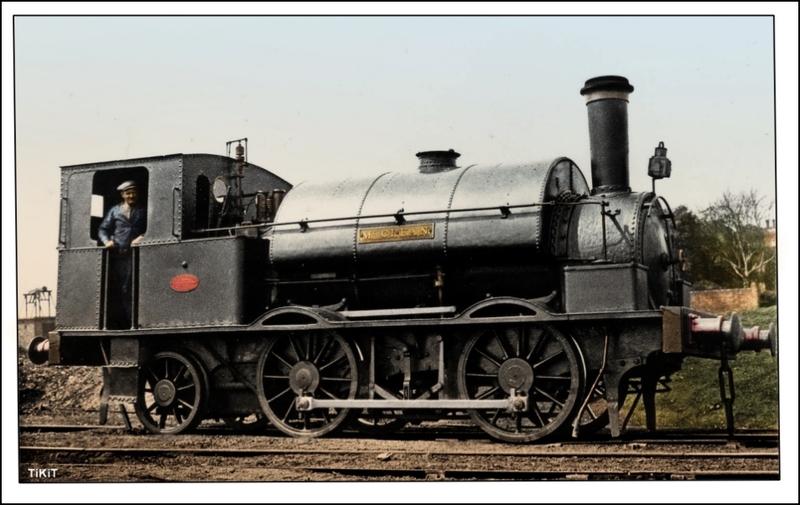 We have contact with an artist who 'colourises' black and white photos and whose work has appeared in many national railway related magazines. 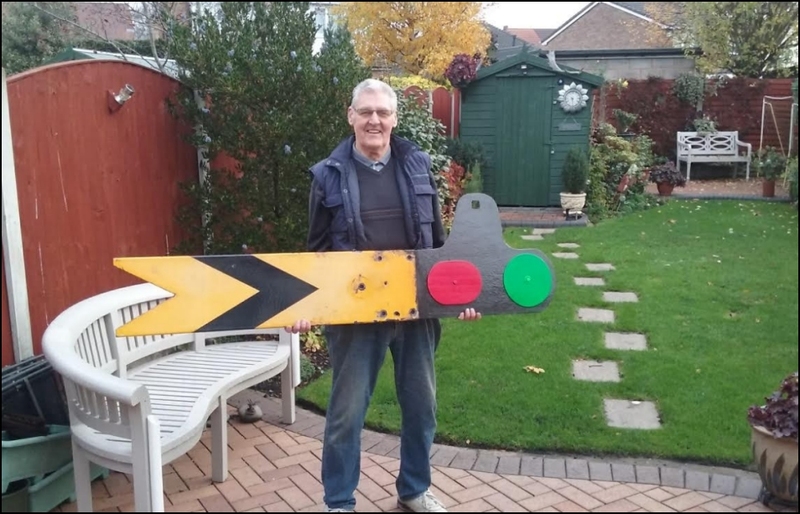 Here is the result of one he did for us, a stunning image of "McClean"
Barry hold the signal arm, Brian holding the crowning glory and the arm in place for all to admire. 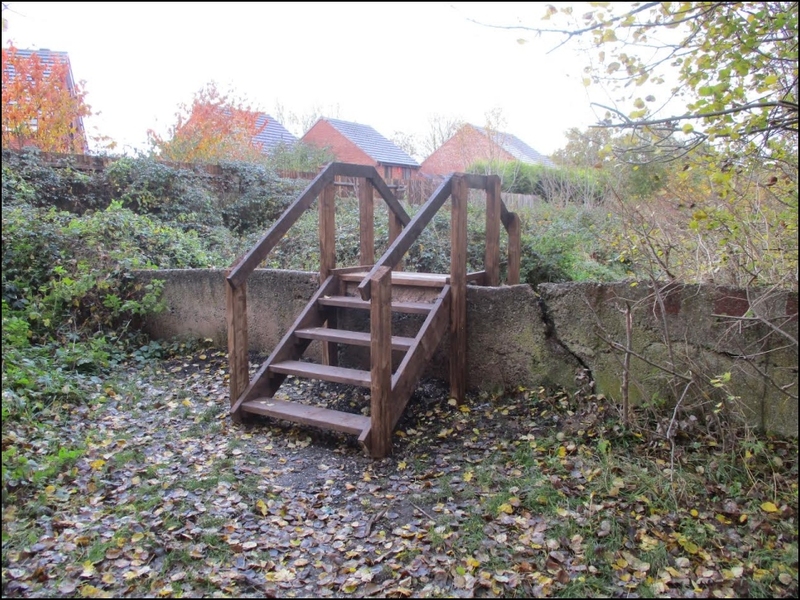 As part of a collaboration between BTT and Railway Paths Ltd (the land owners) we now have some excellent steps over the concrete barrier between Station Road and Ryders Hayes Lane, Pelsall. 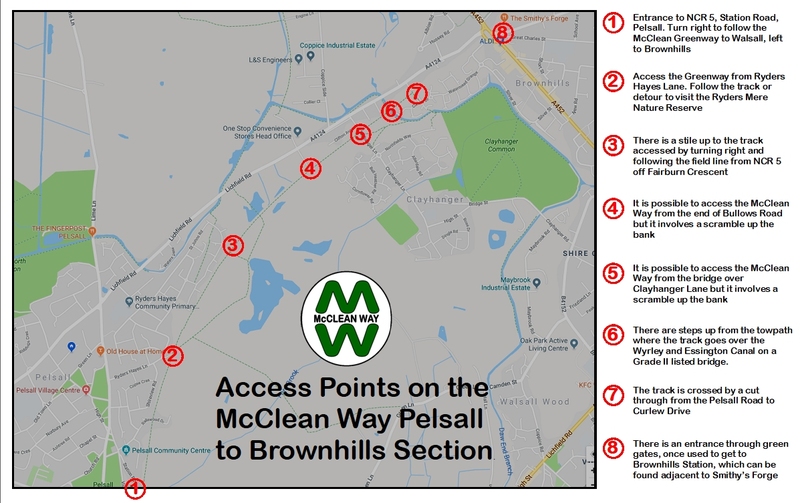 We are often asked about access points so here is a map to help. 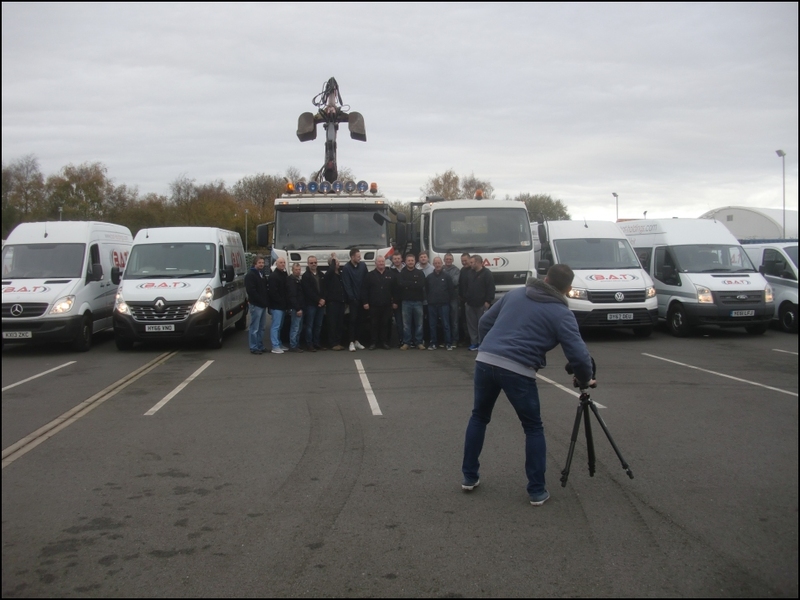 On Tuesday 2nd we had a visit from Central TV who wanted to include us as an item in their 'Active Autumn' series. 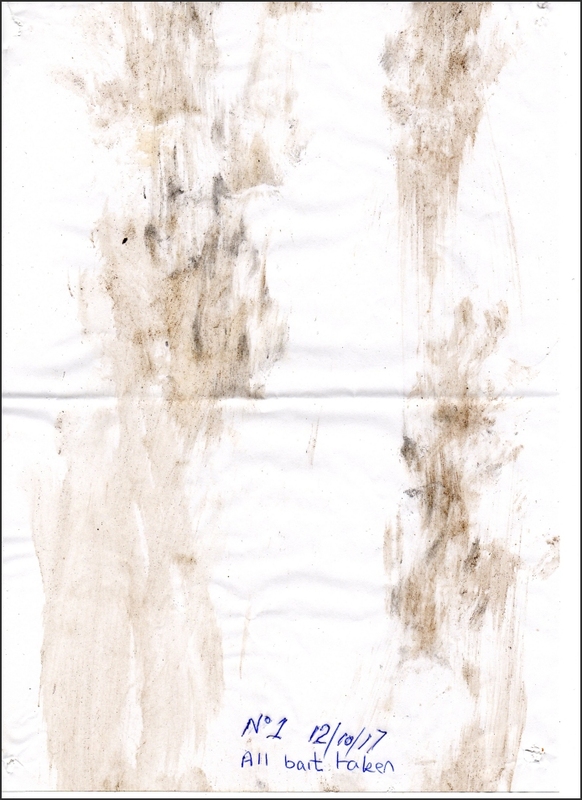 Click above to see the result. We think it does an excellent job of showing how far we've come since that first skip just under a year ago. Action shot from Chris Halpen about to interview Brian who was looking very smart in his new hat. 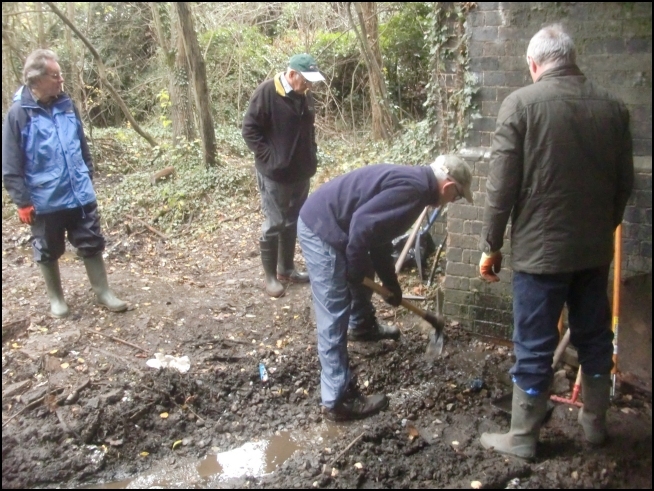 Barry has been emulating 'Time Team' and has uncovered remains of the station building. 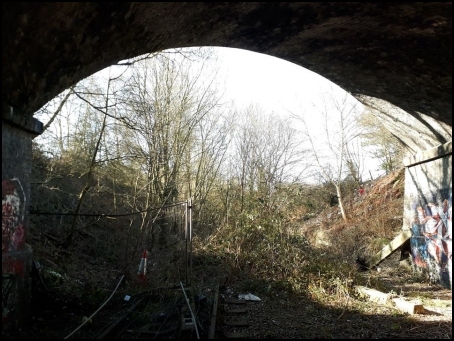 22/09/2018 Bending the channel round just passed the platform to join up with the existing drainage. 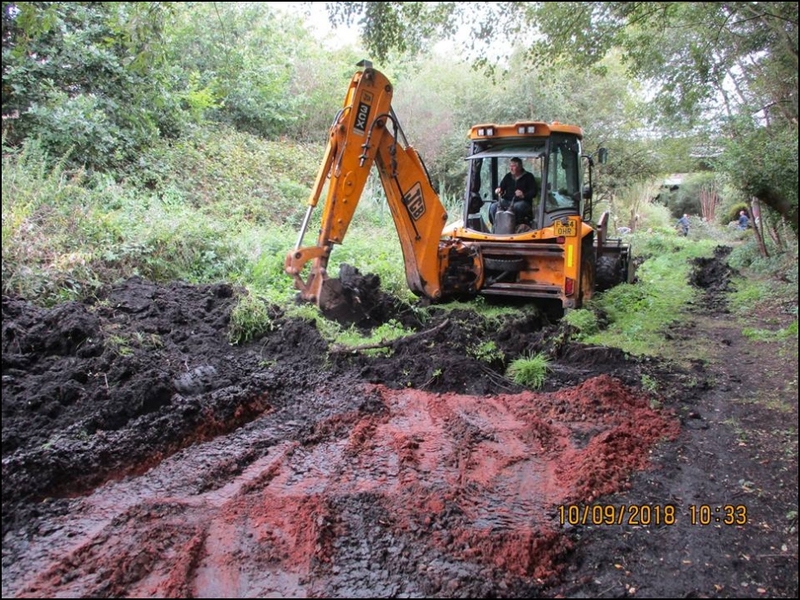 20/09/2018 Up bright and early to let Carl back onto the track under the miner to carry on the drainage channel. 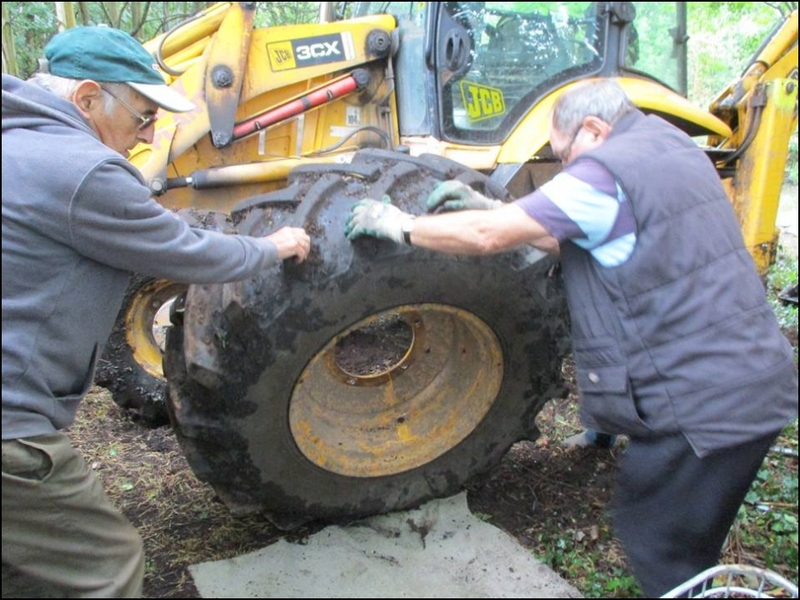 Unfortunately a rear tyre got a puncture but with everyone helping the tube was repaired and work recommenced in the pouring rain! 10/09/2019 We admit it, some of us may be gifted amateurs but we can't compete with the professionals. 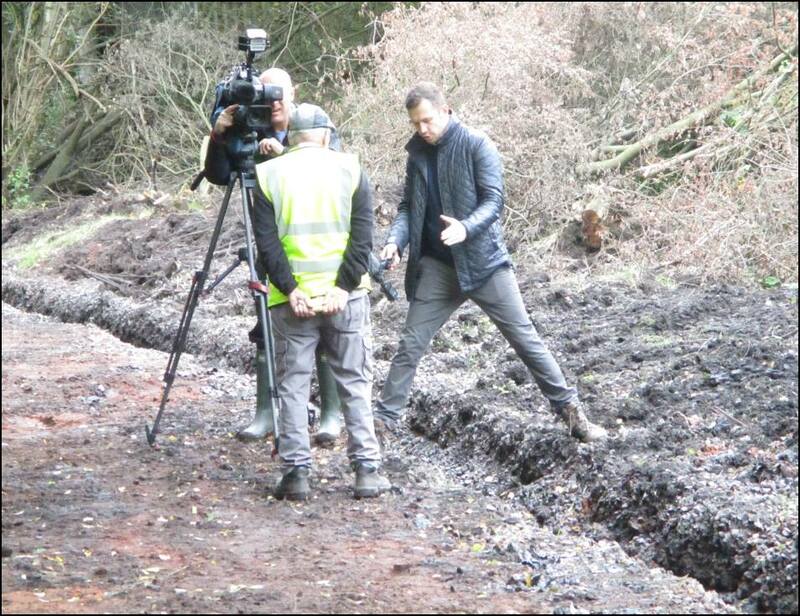 Yesterday Carl had dug as much trench in an hour and a half as we did in a whole day. 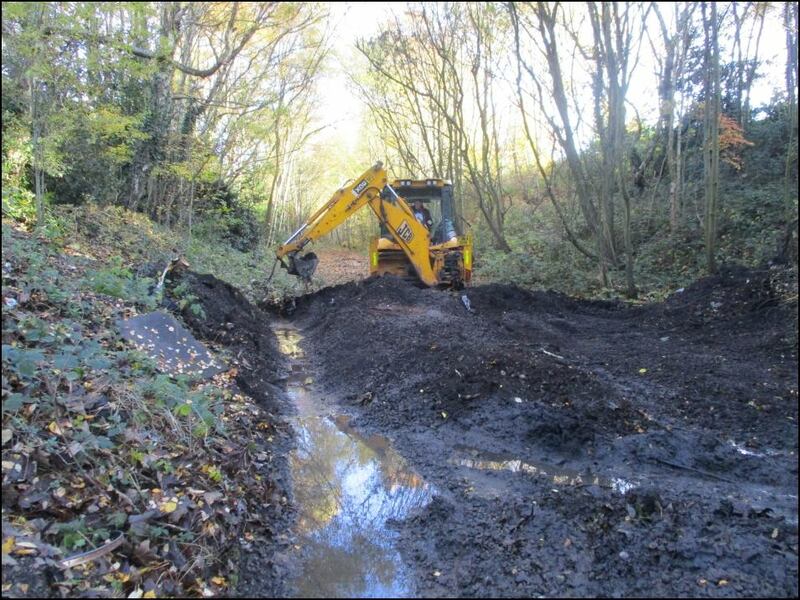 Went down today and it shows it's working as we now have a flood where the trench ends at the moment. As soon as he's available we'll get Carl to carry on towards the A5 and the Cranebrook. 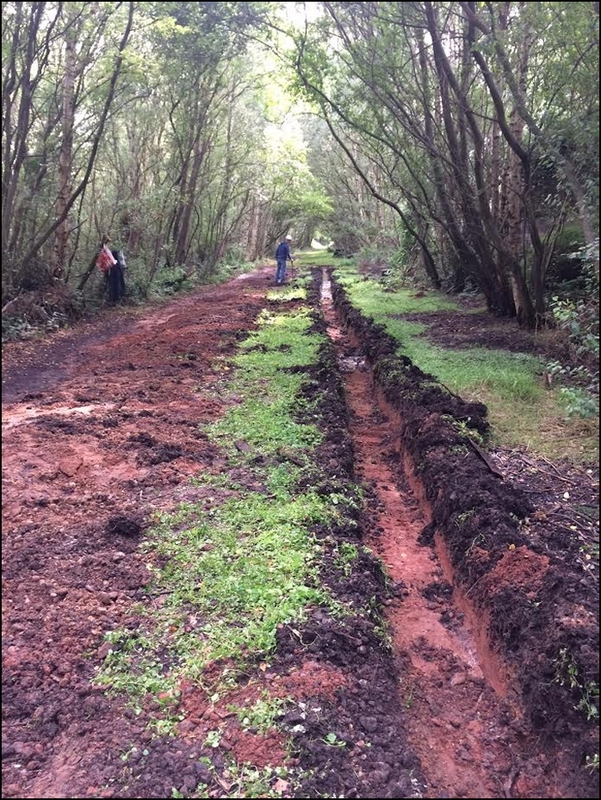 05/09/2018 Isn't it always the way, you start work on tackling the drainage problem and it pours down over night but it didn't stop the team cracking on and achieving 75 metres of trench at the end of the day. It started to fill from the word go and with a few more sessions we should reach the station. Brilliant news and a huge 'Thank You' to everyone who voted for us in the TESCO 'Bags of Help' blue token scheme. We've now been told we came first but don't know how much yet. 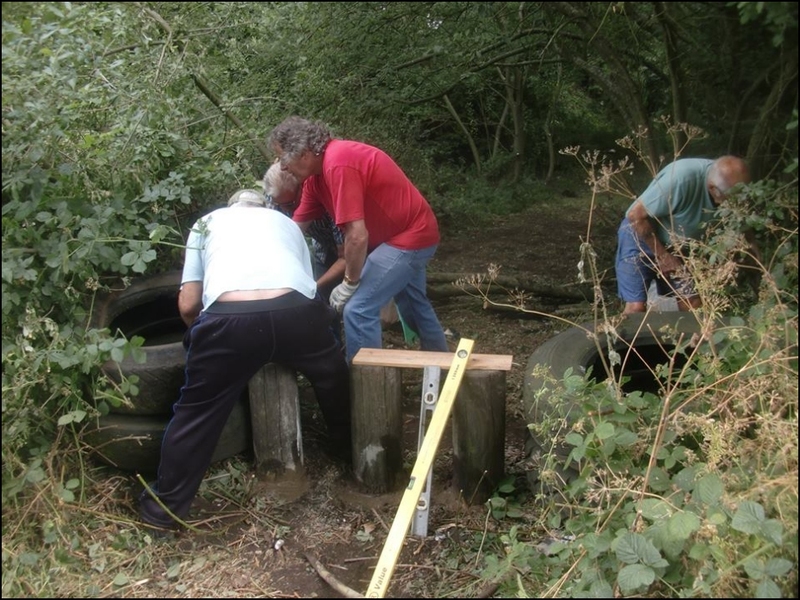 Rest assured, no matter how big or small the amount, every penny will be spent on making and maintaining the old railway track, the "McClean Way", as the fantastic community resource it is. 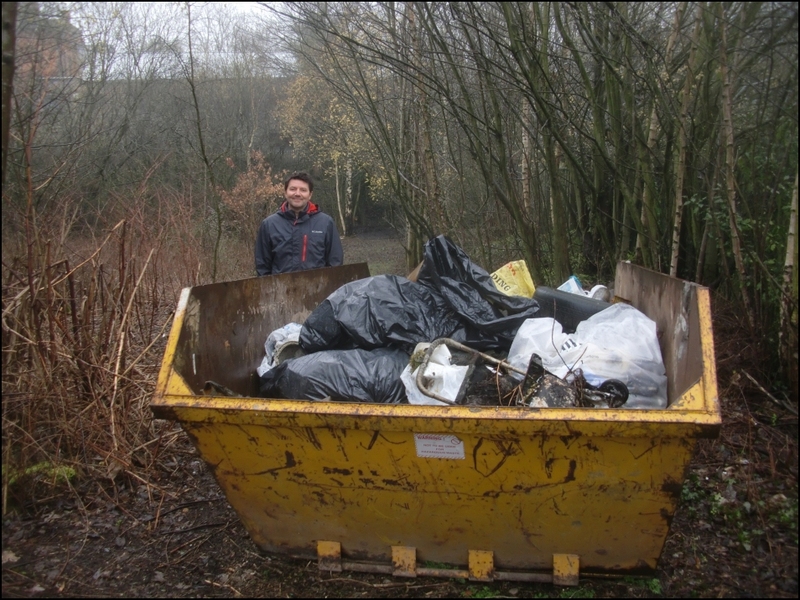 Thanks to Donna and Paul donating a skip we started work on filling it with all the rubbish in the undergrowth. 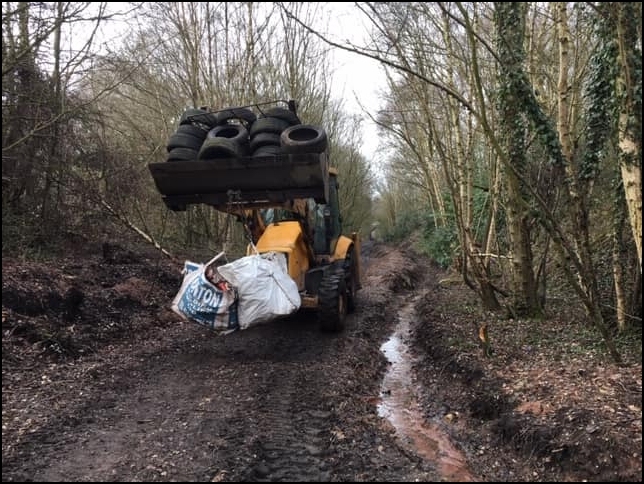 The junk was pulled out to the side of the track, a team of two with barrows collected it to take to the trailer which was then was emptied into the skip. What organisation. Very interesting morning on Wednesday (25th) looking at the police drones on Tesco's car park in Brownhills. PC Chafe kindly sent us a shot of the miner. 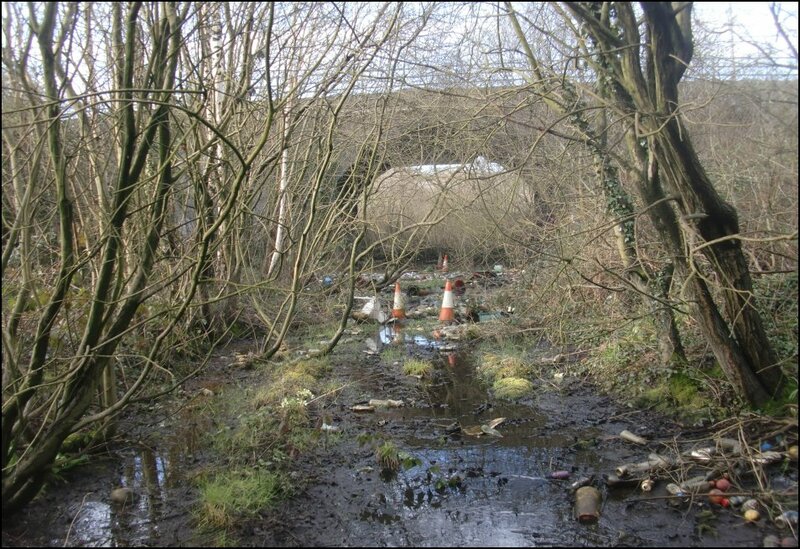 Looking at the 'McClean Way' you can certainly see why it is a Greenway. 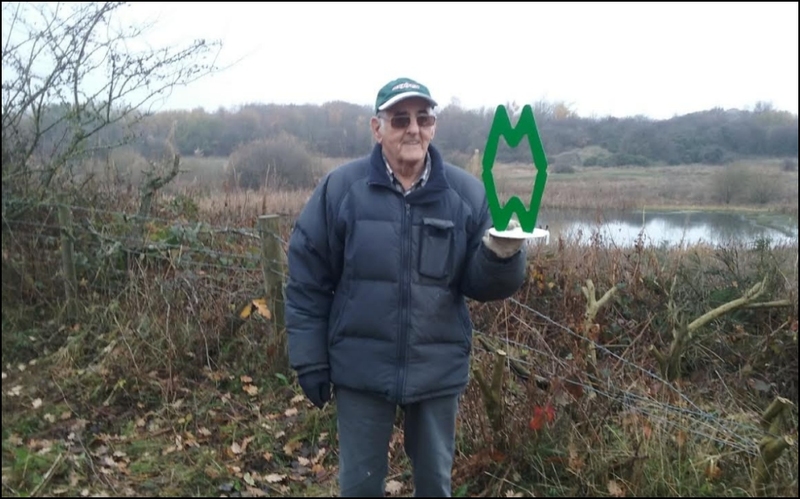 Denis met up with Andy from South Staffs Water yesterday. 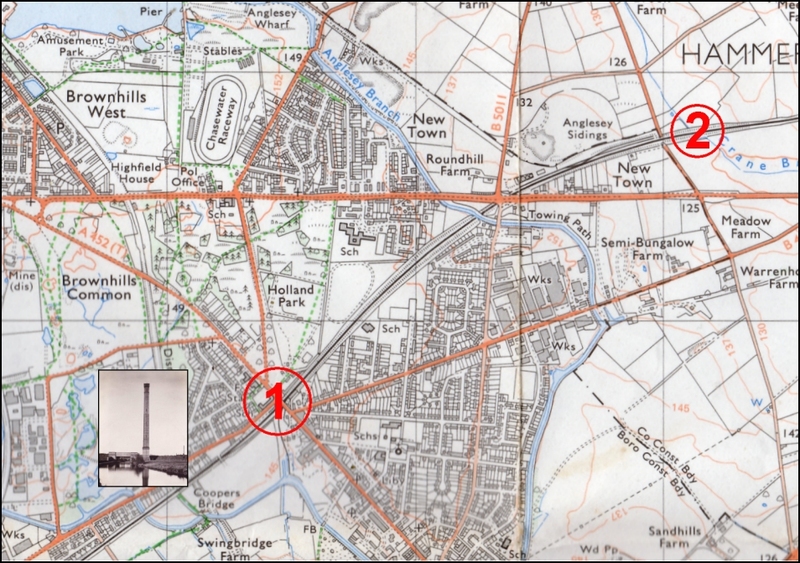 Andy had an electronic map where the 24" water main built by John Robinson McClean is shown even though it fell out of use about 1972. 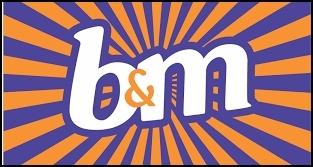 The position of the pipe through the station area is on the side of the doctors and then comes across towards B&M with a small section missing. 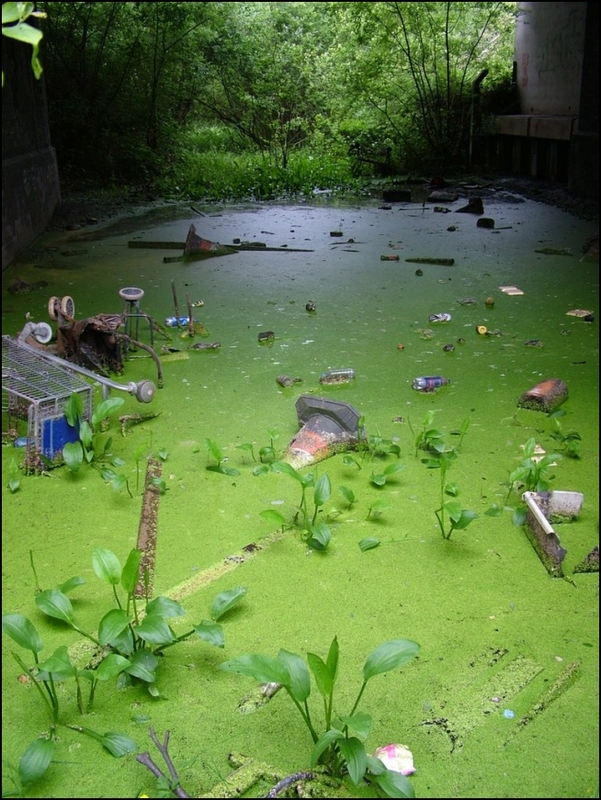 Andy thought the water coming up between the bridges was more or less where the pipe was. 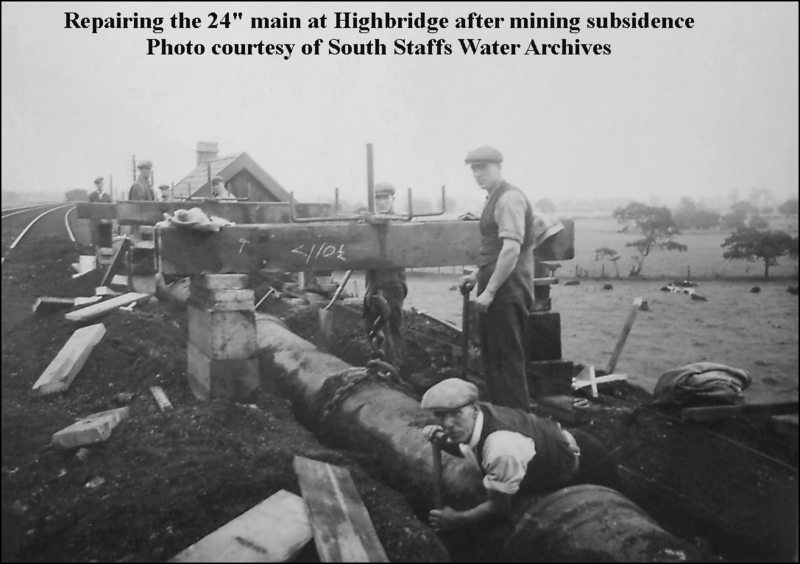 We need to investigate further but interesting to speculate that a 165 year old pipe may still be carrying water albeit not to where it's wanted. 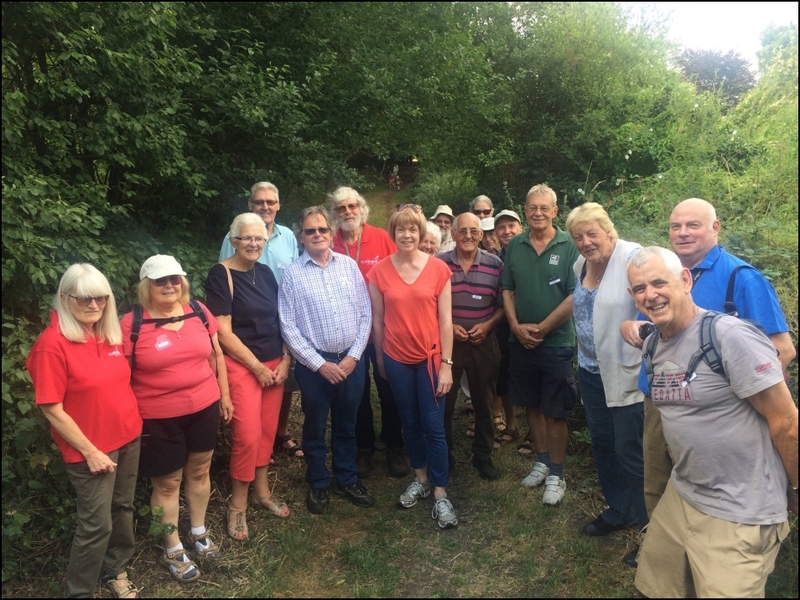 We were not sure how many people had seen Brian's comment about the path now being walkable but quite a few did and joined us on the track this morning when it was looking at it's best. 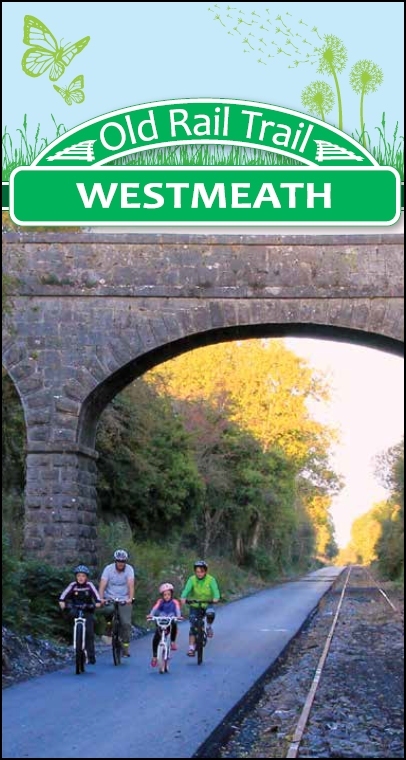 We were very pleased that Wendy Morton managed to juggle her diary and fit us in before dashing off back to London. 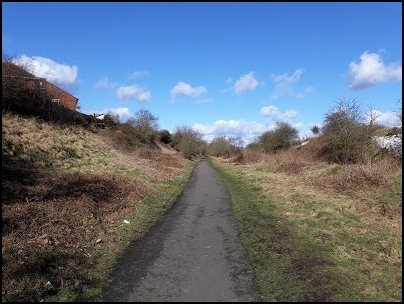 The track, the 'McClean Way', is a safe and valuable environmental resource for schools to use and we were really pleased when Sim, the SUSTRANS ecologist, organised a session with a local school. They all had a great time apart from one thing, the amount of dog pooh in the grass. 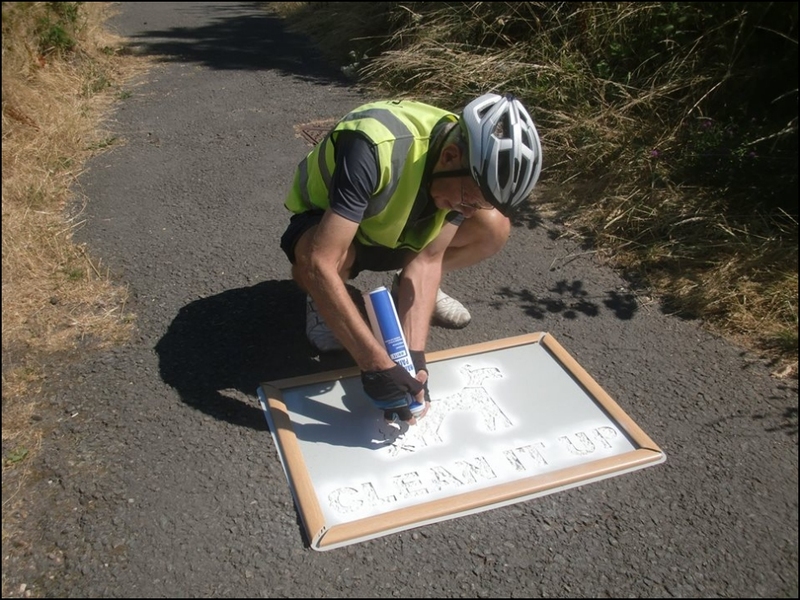 To try and remind owners of their responsibility to 'Clean it up' we were given a stencil by SUSTRANS which we used seven times yesterday. 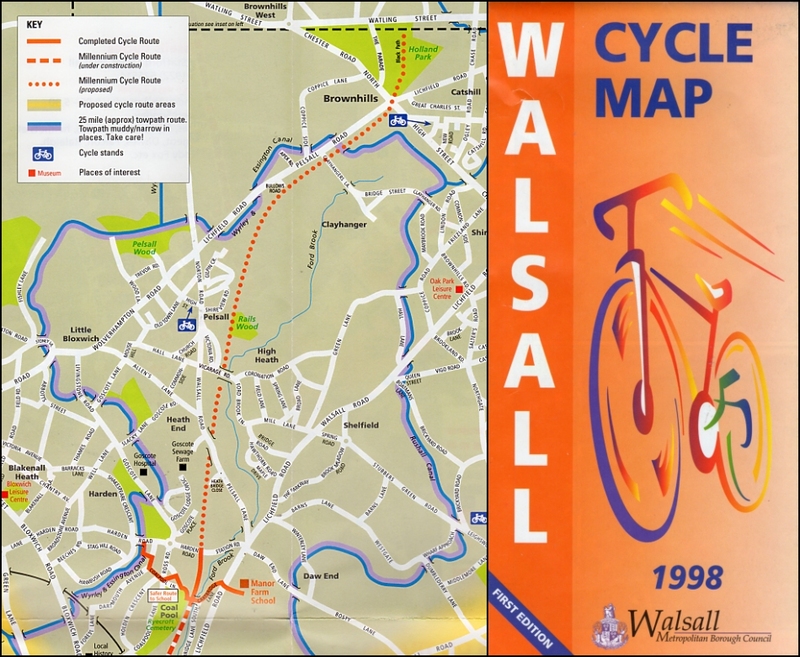 If you follow them up from Rushall you'll see it was a learning curve with Bob's at Pelsall nearly perfect. 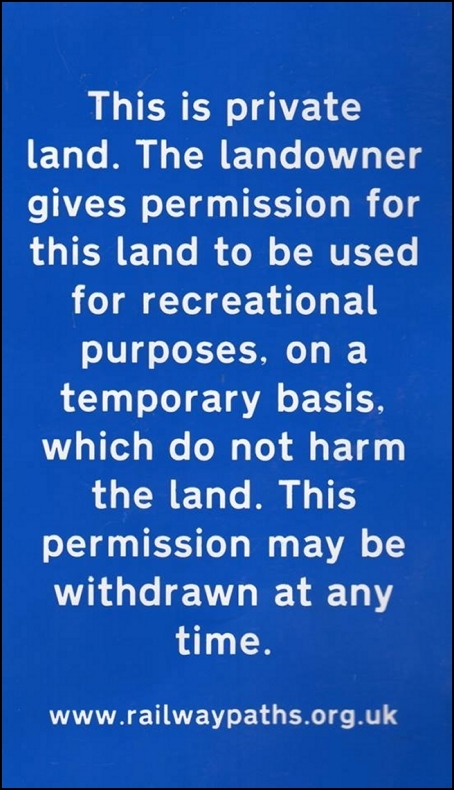 The sign we are putting up at points along the track which goes someway to explaining why we can only do so much at this time. 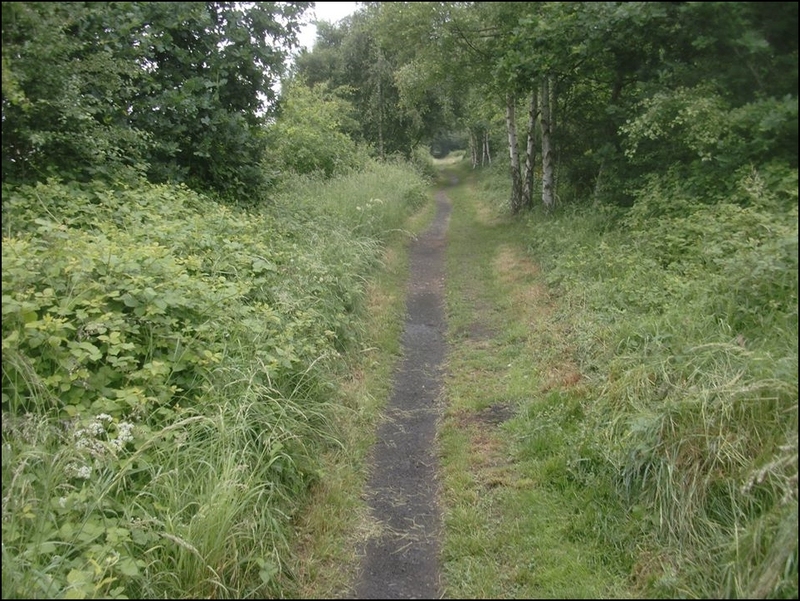 After a few mentions from active users of how long the nettles and brambles were getting on the section between the canal bridge and Bullows Road a group went out and trimmed back just enough without disturbing the wildlife. 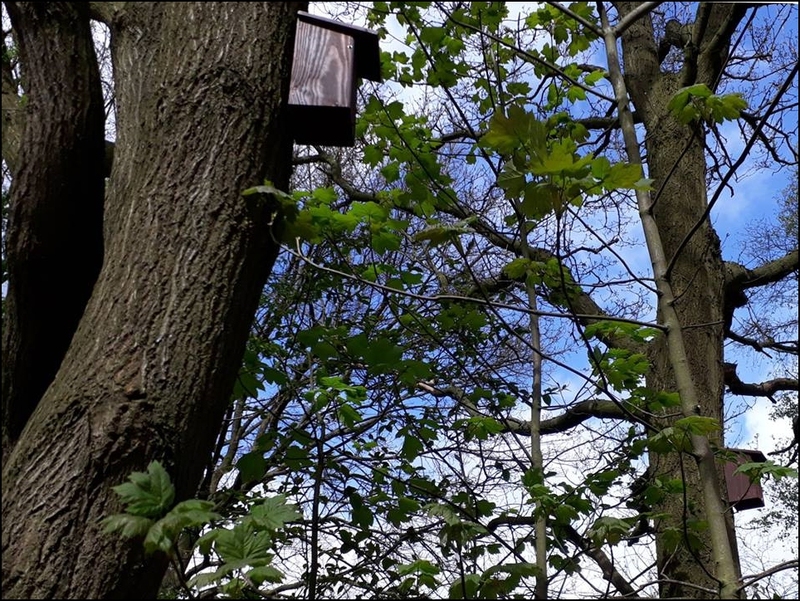 After Ian visited from Canada a few weeks ago when gave us an excellent talk with photos from his soon to be published book he has very kindly sent us a few 'preview' images. 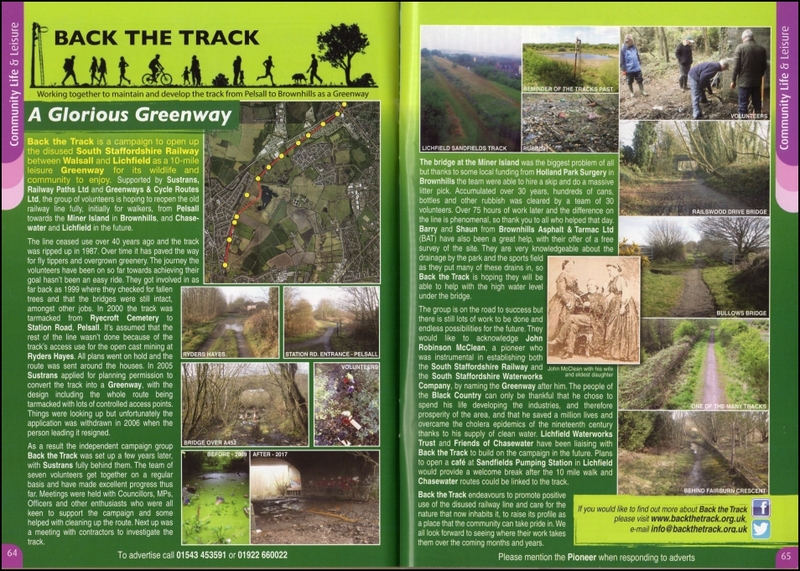 We'll keep you posted as to when the book will be available which should be fascinating with so many never seen before views of the track. 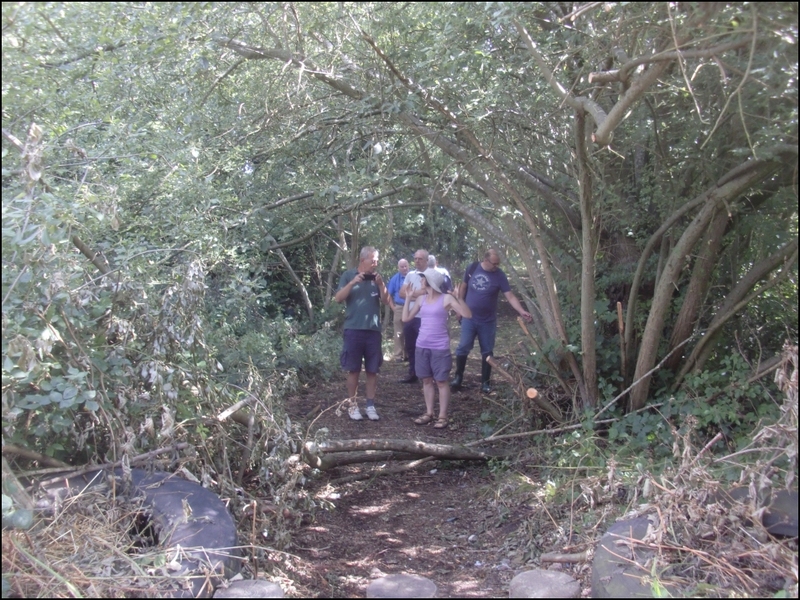 Last week opened up a whole new vista, a fairy glade which wasn't wet! 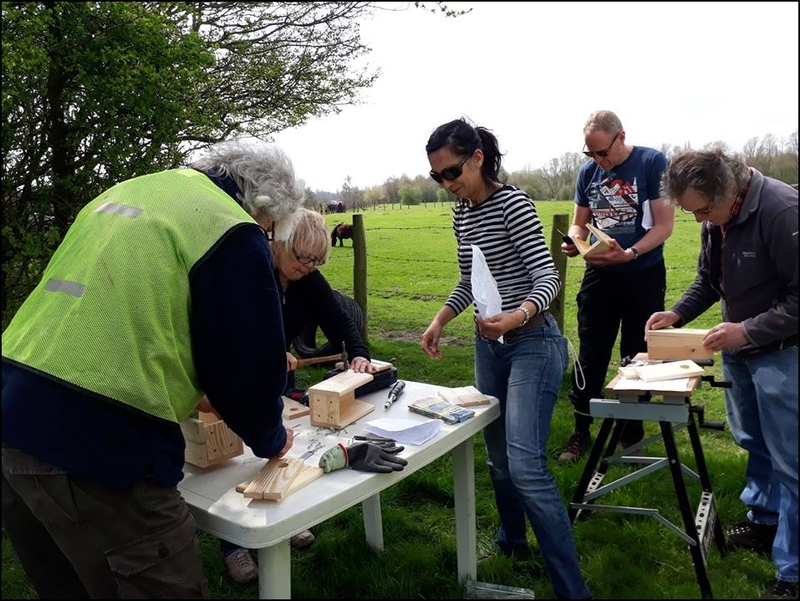 The sunny aspect was much appreciated by group members. 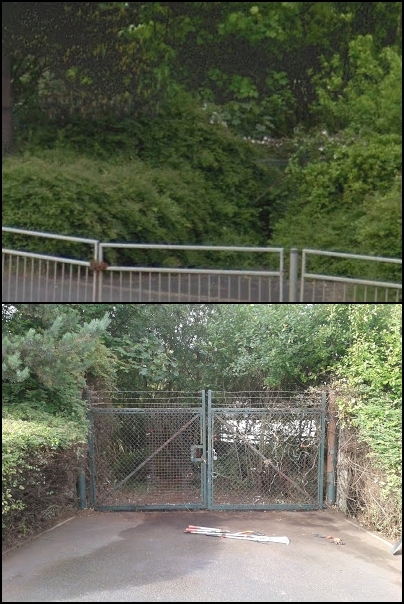 This week we are starting to clear the ramp up to Smithy's Forge gate which will provide the missing link. We are very pleased to find we are included as a choice in the TESCO's blue token charity scheme in the Brownhills store. So if you feel you would like to support our local community project, as they say, "Every little helps. The winner will be announced at the end of June. Before he left to go back to Canada we met up with Ian on the track so he could point out all the bits and pieces he remembered from 30 years ago. 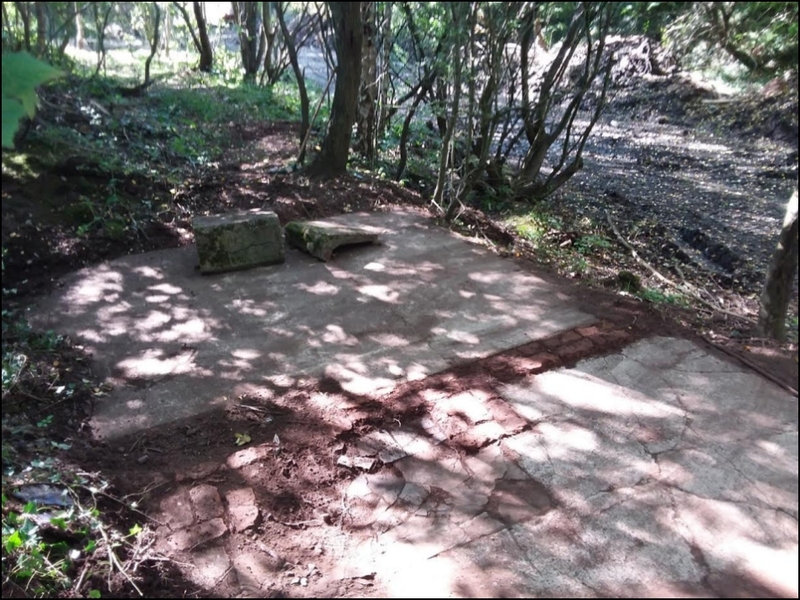 We managed to locate the edges of the concrete channelling which may have acted as drainage but unfortunately most of it has been destroyed or has been lifted and is lying around in piles. Ian also pointed out the plate layers hut. We'll make sure he gets an invite to the official opening. 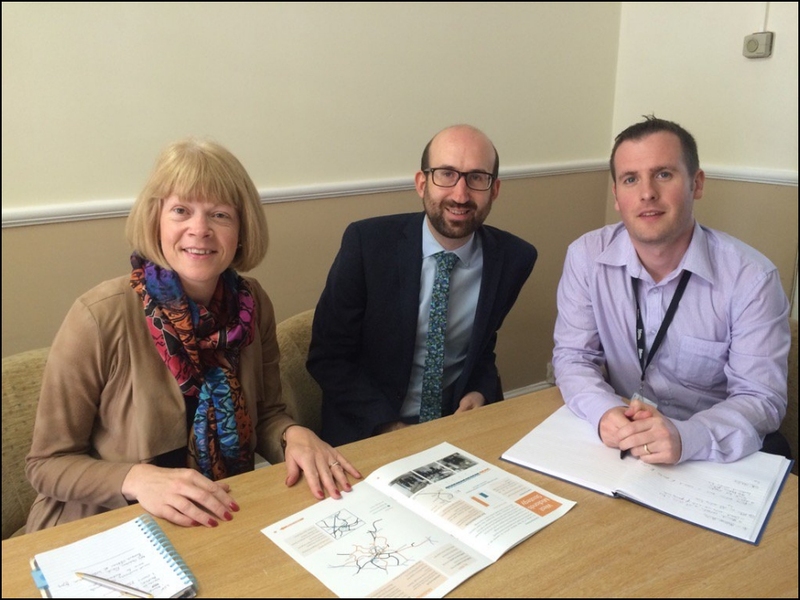 We had a great meeting with Ian (on left) yesterday, May 2nd. He currently resides in Montreal but is in Brownhills visiting his Mother. 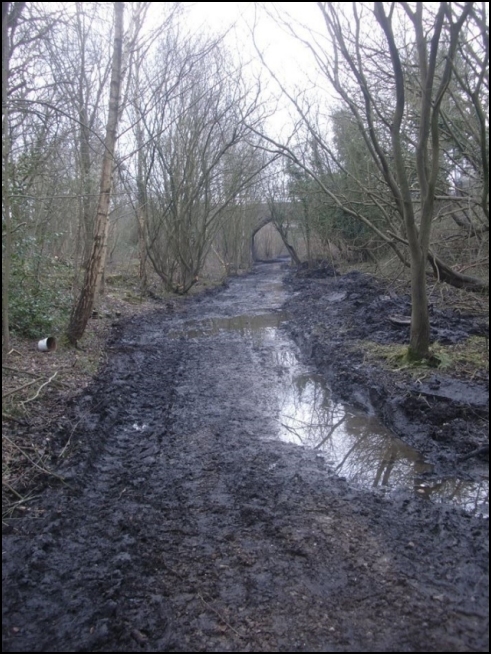 He had heard of our drainage problems even in the colonies and emailed to say he had some photos of the track and drainage channels, were we interested? Ian is writing a book about the line from the mid 80's and showed us some fantastic pictures he has in the book and has promised us ones we can use when he gets back to Canada. 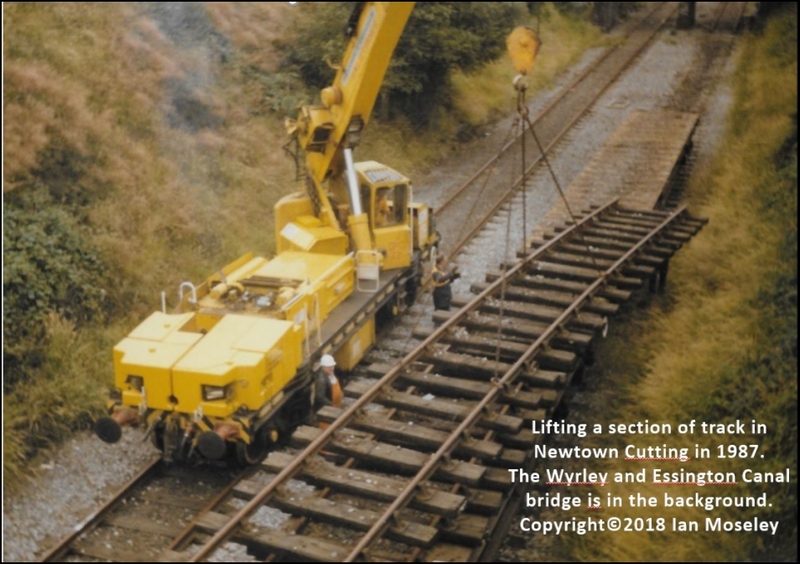 They must be unique as he took them when was he was a schoolboy and show a detailed account of the track being lifted and the bridges being built. Down by the access ramp built to help with the track removal which blocks the drainage through to Cranebrook. We're deciding if we can break through and stop the lake forming. 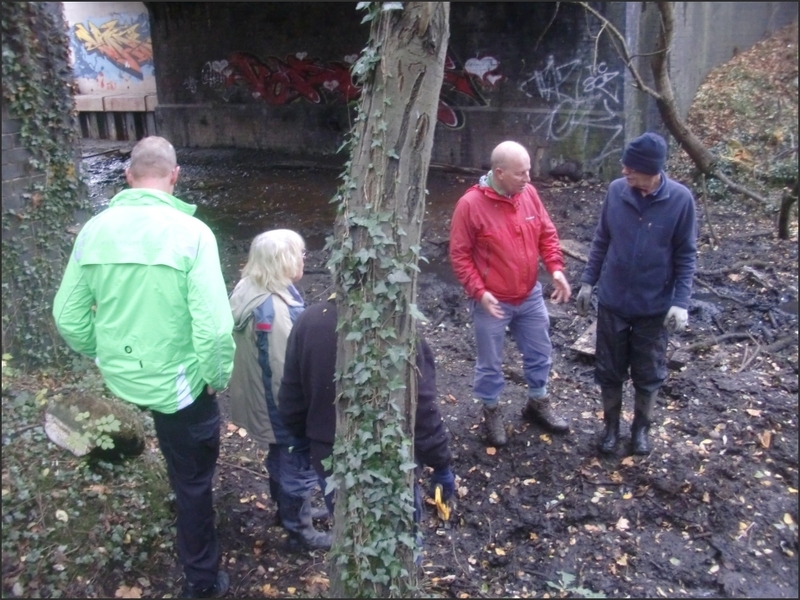 Meeting up with Vic and Simon from the Burntwood Action Group on a cold damp morning yesterday. 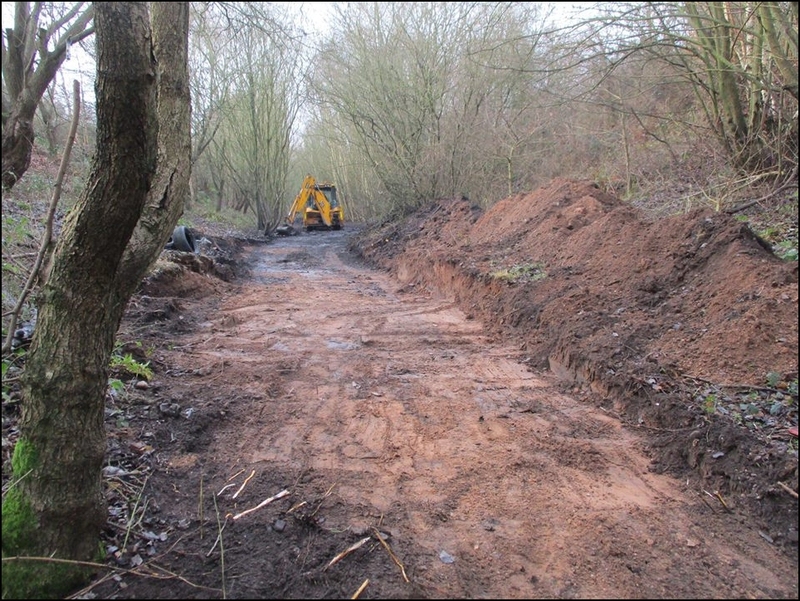 They are as enthusiastic as we are in getting the track accessible especially in their area north of the A5. 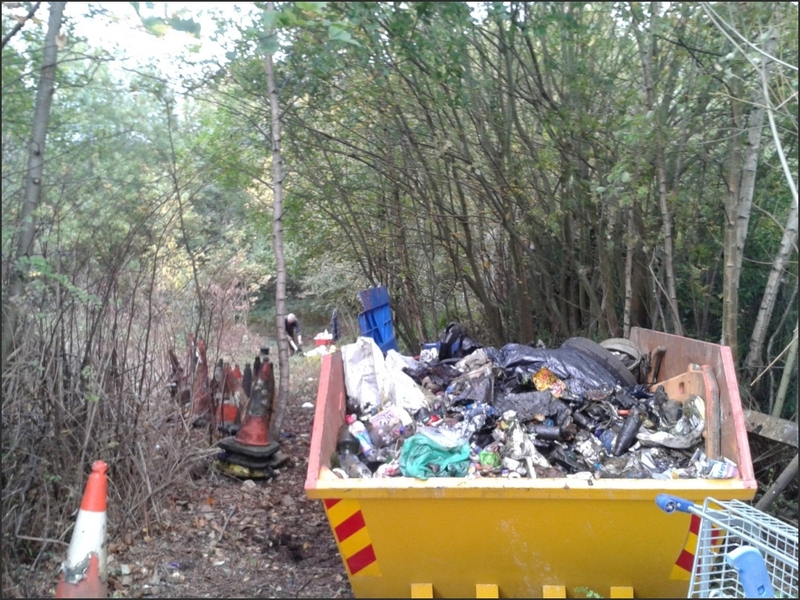 We also got the skip, kindly donated by Donna and Paul at Abcell Ltd , collected. 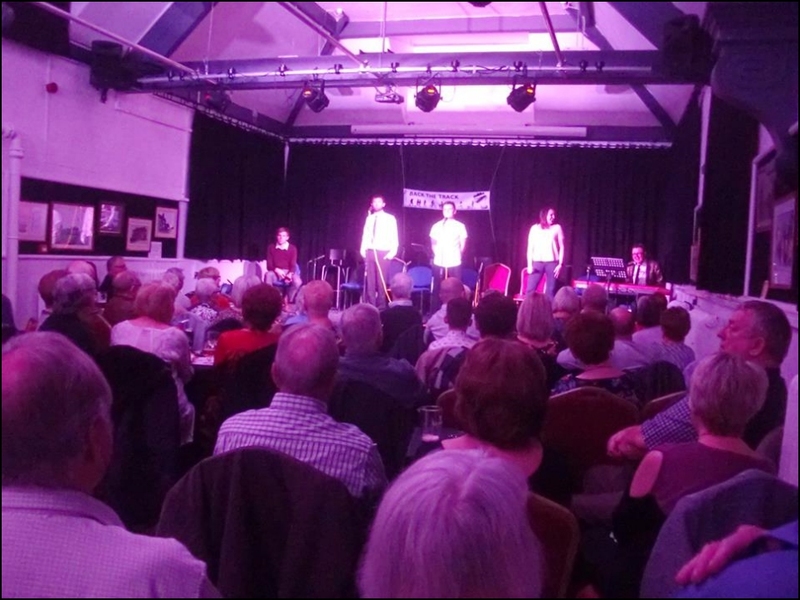 The charity event for 'Back The Track' at The Lamp Theatre in Brownhills on Saturday 10th March at 7:30 pm was a sell out and enjoyed by everyone there. Thanks to the Aldridge Ukulele Band, Follow Spot Productions and The Lamp Theatre for the generous donation of their time and the venue. 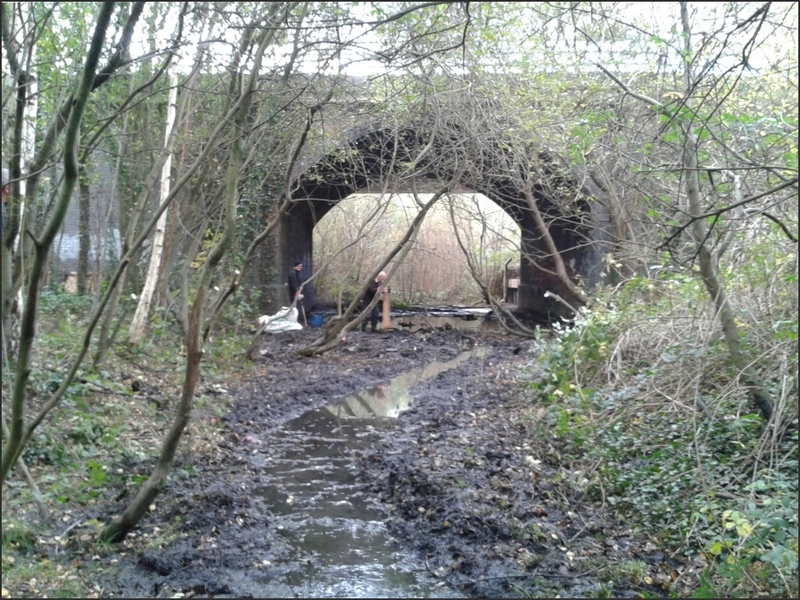 We raised over £400 towards materials to enhance the area under the bridges. One source of the water, drainage holes in the bridge! 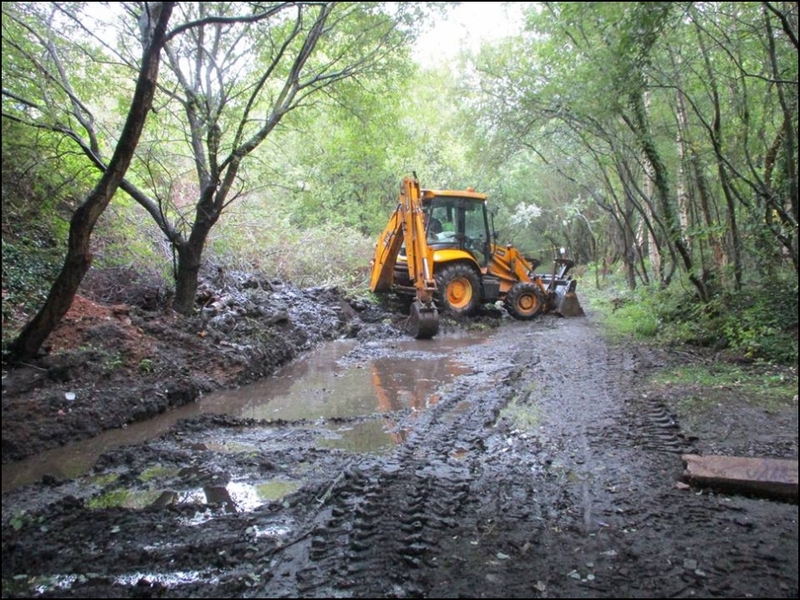 After the digger had been at work, just a pity there is still quite a lot of water to deal with. 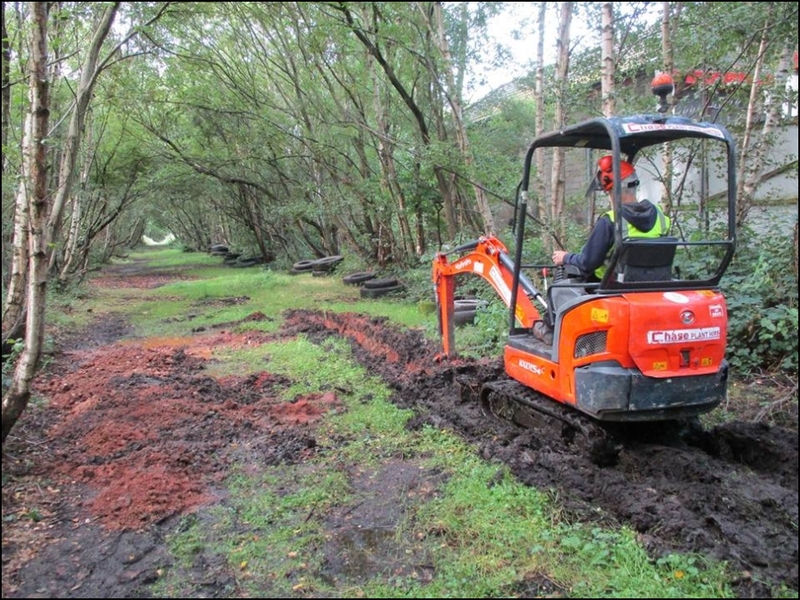 We have managed to get a digger down on the track and as can be seen in the video what a fantastic difference this has made. 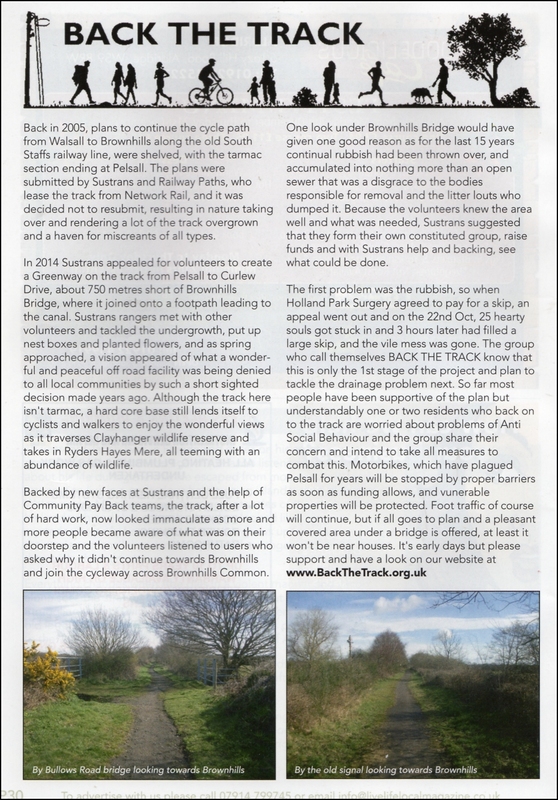 We've started off the New Year with an excellent article in the January edition of 'The Pioneer' magazine. 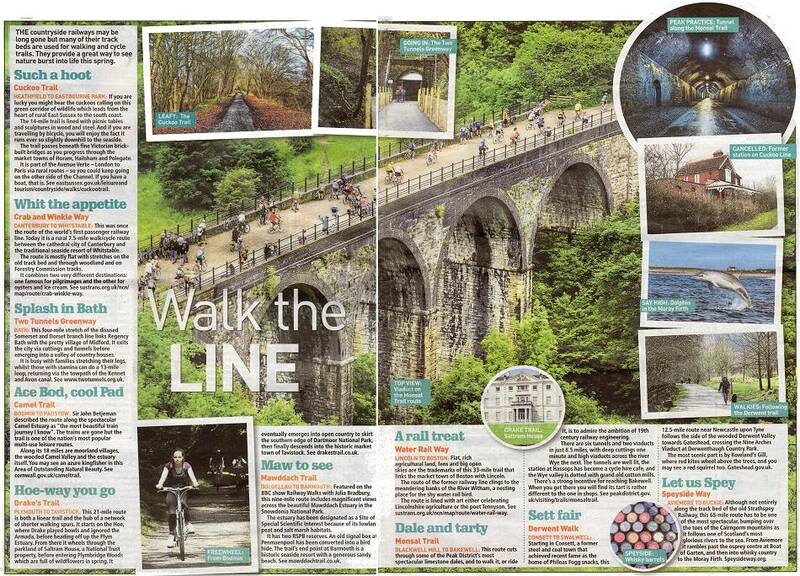 Many thanks to Emma for the write up. 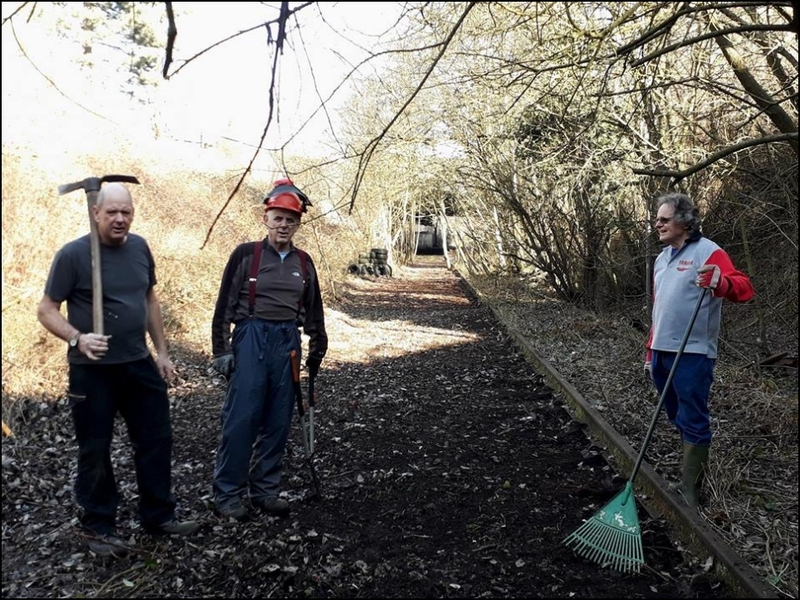 Intrepid members started the New Year by clearing out the existing water channel and then set about extending it well past the point where the ramp behind the library is going to be. 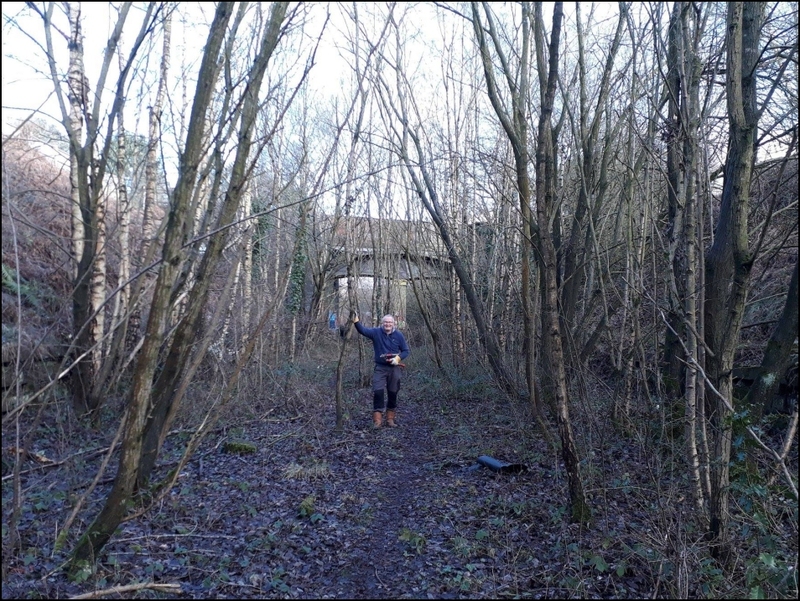 They lopped branches off trees that have fallen across the track. 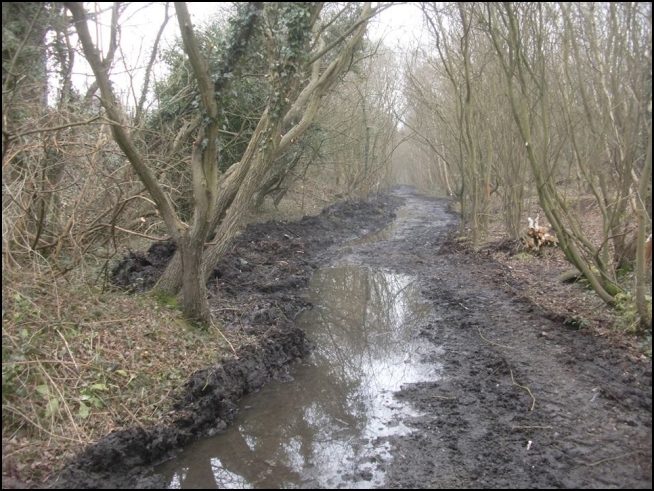 which allowed the water to flow better and will make cutting the trees up much easier. 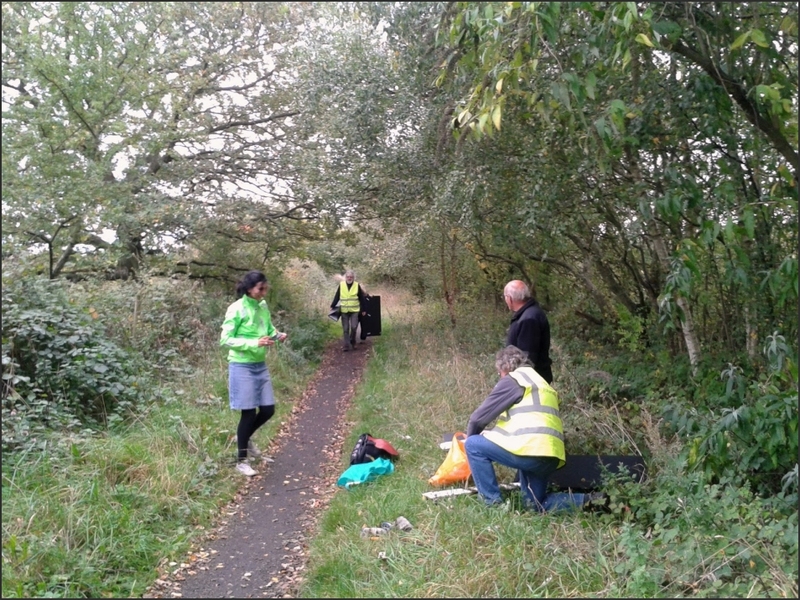 They also did another mini litter pick and collected a few more bags of rubbish. 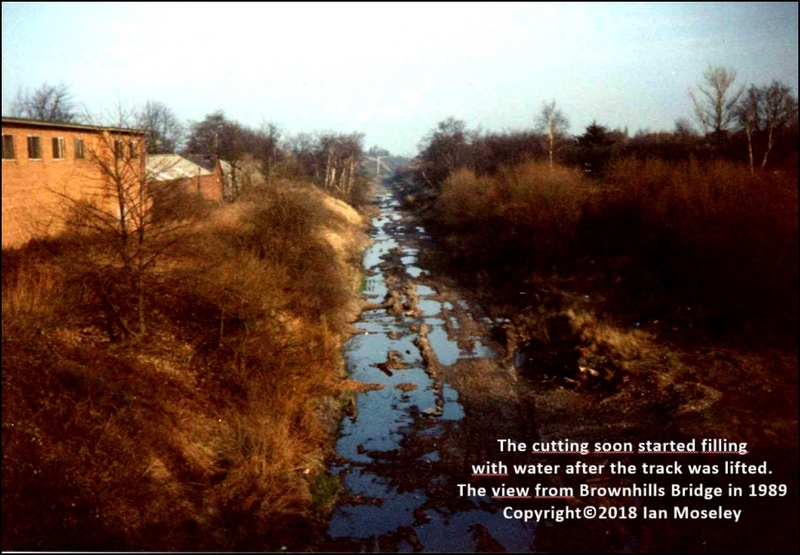 The good news is that the water is flowing freely now to about 50 yards past where the ramp will be so it seems there is a continuous gradient right through the station and no level bits which was feared might be the case. 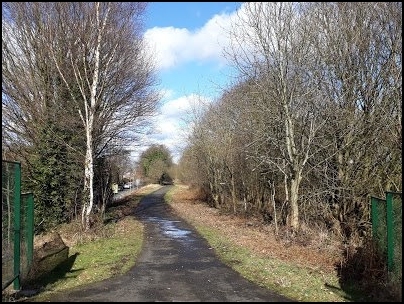 Having spent a couple of hours clearing leaves off the track in Pelsall this morning (6th) we went, rather appropriately, to The Railway Inn for a most pleasant lunch very kindly paid for by Sim and Martyn from SUSTRANS. 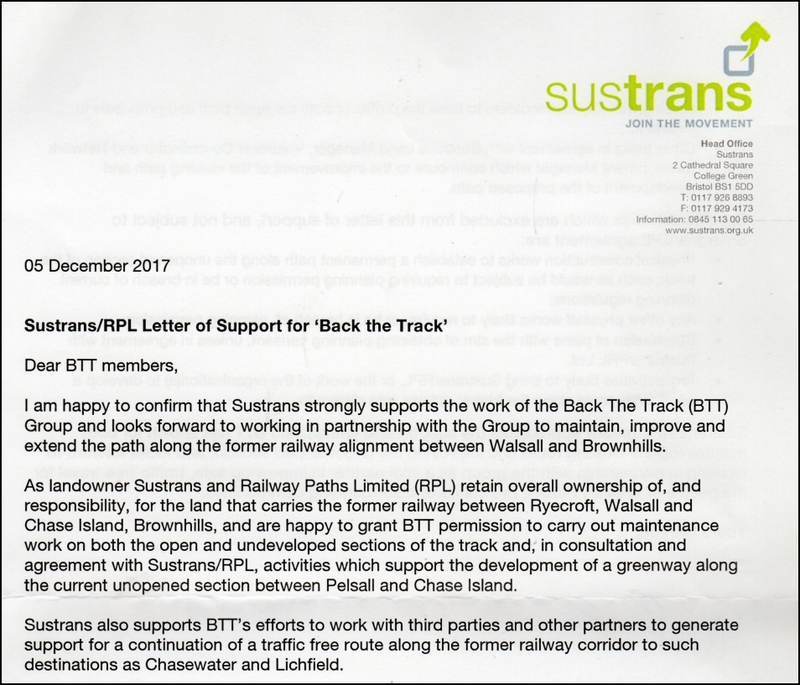 It was while we were there Martyn gave us our excellent early Christmas present in the form of this letter at long last making us officially 'official' It states exactly what we are aiming for plus we like the reference to working with third parties, something we've tried to do all along. 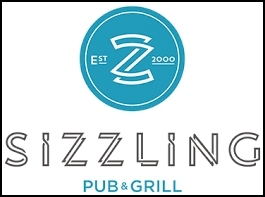 We were surprised to find we featured in this months edition of 'Live Life Local' We hope they don't mind us reproducing the page here. 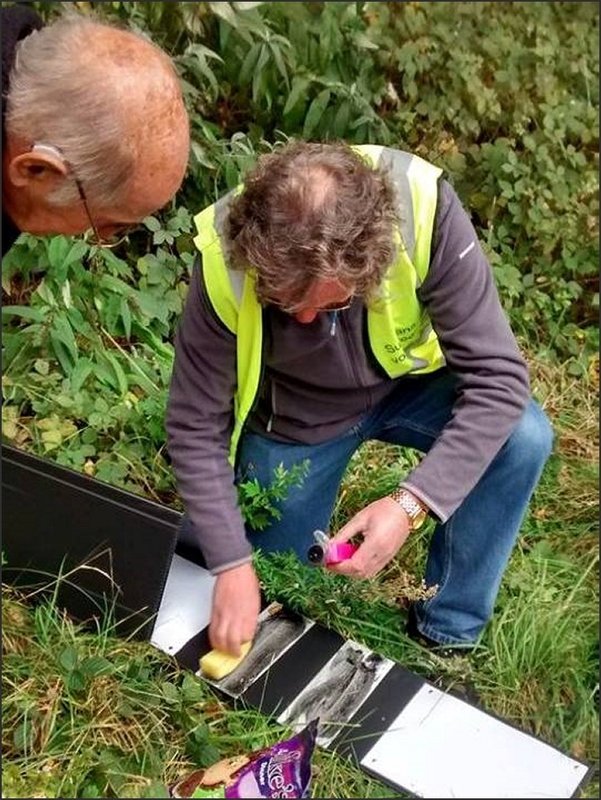 It's always useful when we come across people with local knowledge especially when it comes to matters of drainage. 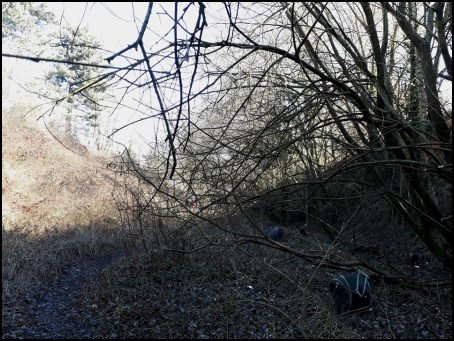 We know the track falls towards Lichfield from the highest point where the surge stack used to be next to the canal in Clayhanger. 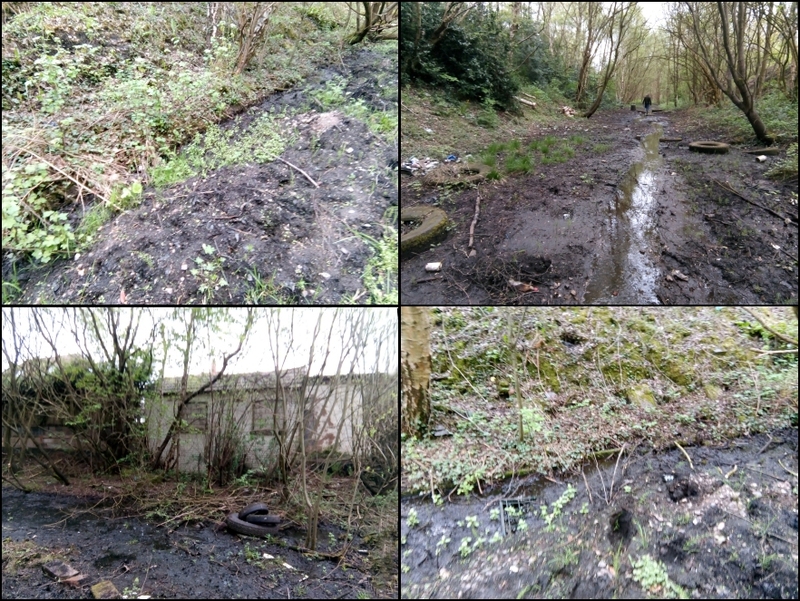 We've been told from the Miner roundabout (1) water drained by gravity into the Crane Brook (2) If we can move the years of silt then, hopefully, nature will take over. 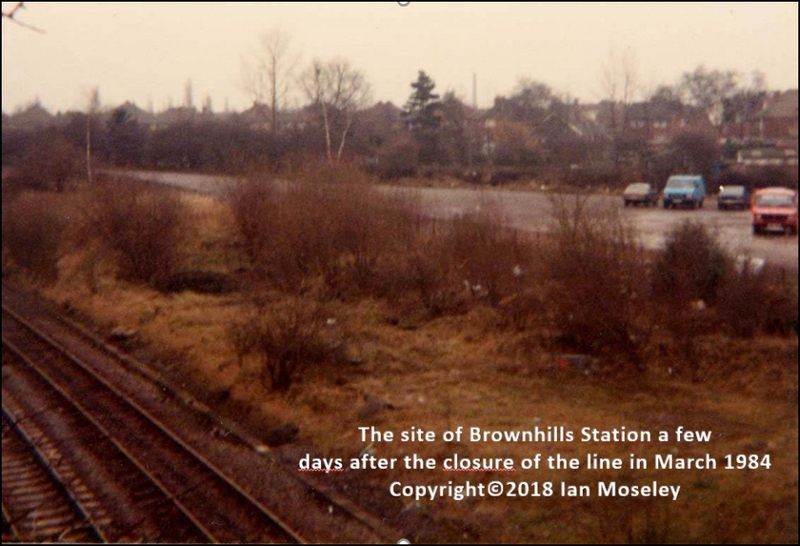 SPOILER ALERT If you don't want a sneaky preview of Brownhills Asphalt & Tarmac's Christmas card don't look at this photo. We met up with Barry and Shaun from BAT who were having a photo shoot but then took time out to chat to us. They are very knowledgeable about the drainage by the park and sports field as they put a lot of the drains in. 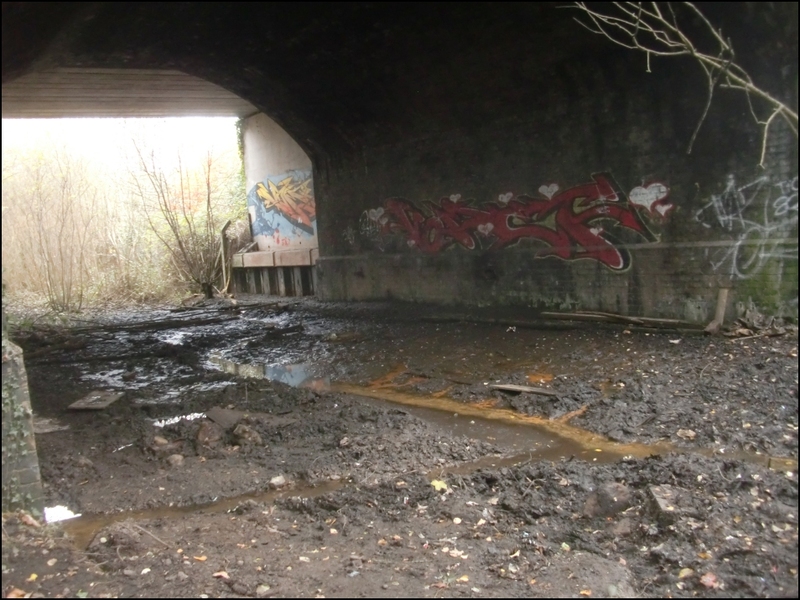 They've offered to do a survey for us but then had to dash off for an emergency leak (in a pipe I hope) but we'll arrange to meet up under the bridge ASAP. 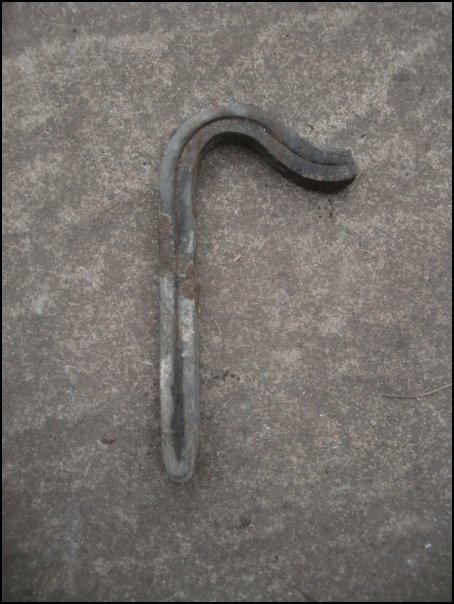 A souvenir of the railway, a rail anchor. 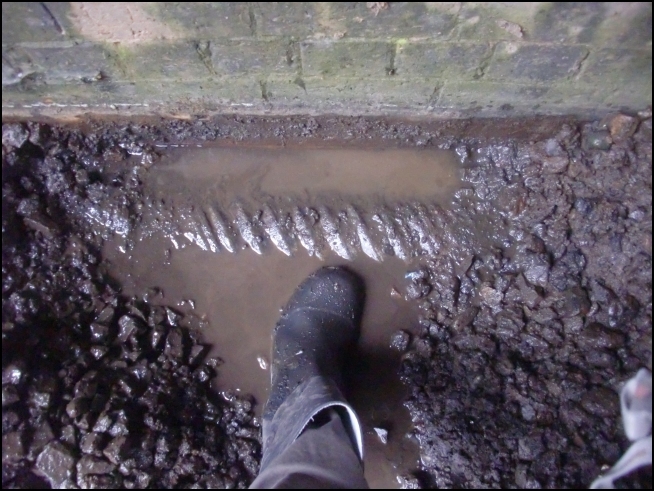 At work on November 13th trying to uncover one source of the water flow, a vintage cast iron pipe which seems to be a bit of a mystery. Does anyone recognise it? 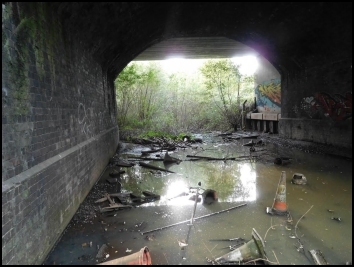 Under the Miner Island in Brownhills, Monday 30th. We had all the 'big guns' with us namely Martyn Brunt, Midlands Land Manager for SUSTRANS and Railway Paths Ltd and Huw Davies, National Cycle Network Director for SUSTRANS and Chief Executive of Railway Paths Ltd. Huw was previously a Consultant Railway Civil Engineer for 5 years so he is ideally placed to give us advice on the flooding. 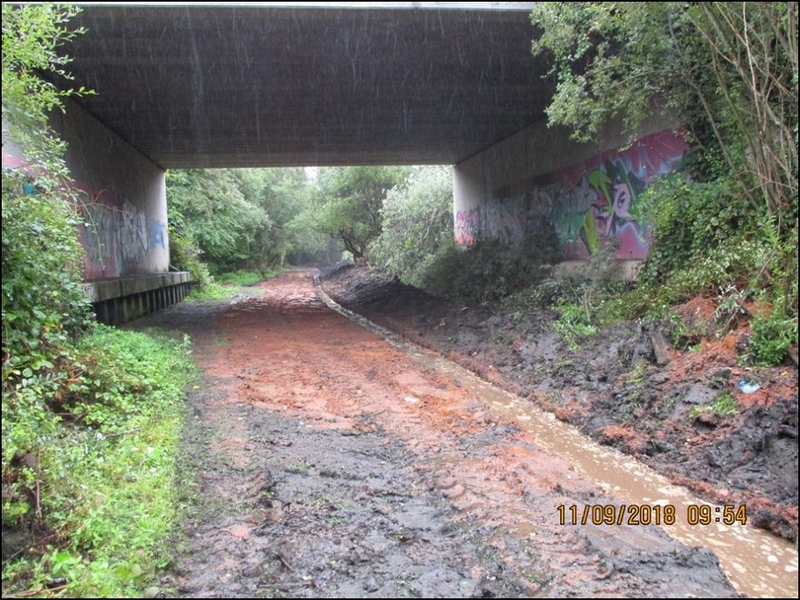 Having said that the tranches dug last week have made an amazing difference under the bridges as can be seen, just glistening mud. 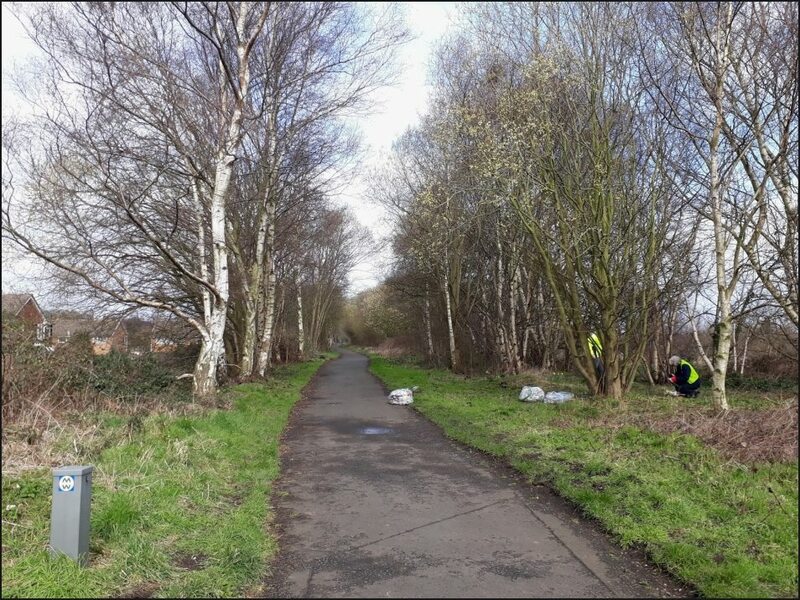 It was a 'red letter day', Sunday 22nd, with the litter pick under the Miner Island in Brownhills happening at last and what a difference a day makes! 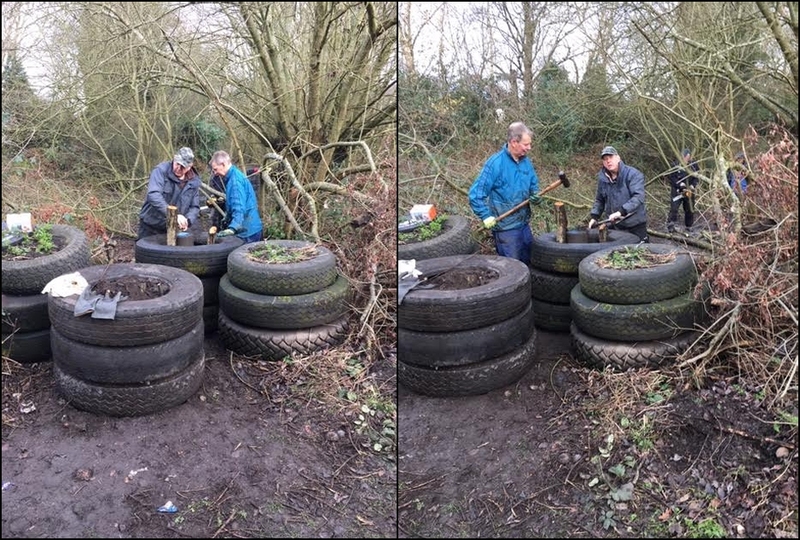 We had nearly 30 volunteers starting just before 10:00 with some stalwarts still working away at 3:00 and in total we probably had around 75 work hours. 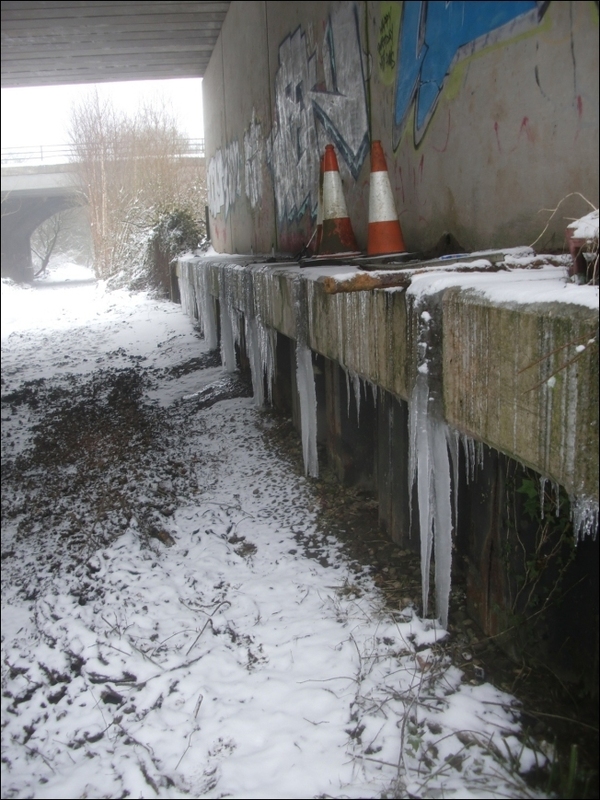 The idea of digging drainage channels has really paid off with the water level under the bridge dropping substantially. 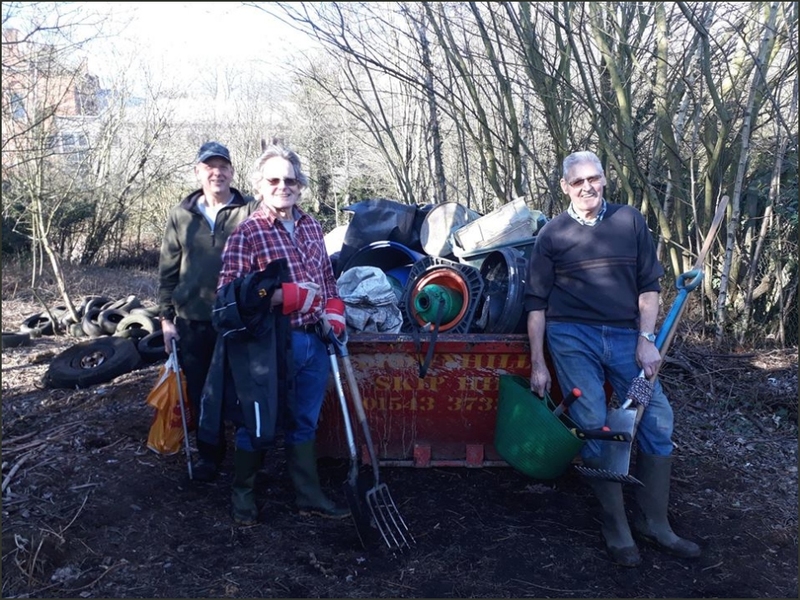 Just look at the photos to see what an outstanding achievement so it's a great big 'Thank You' to all the volunteers of all ages and Holland Park Surgery for paying for the skip, we couldn't have done it without you. 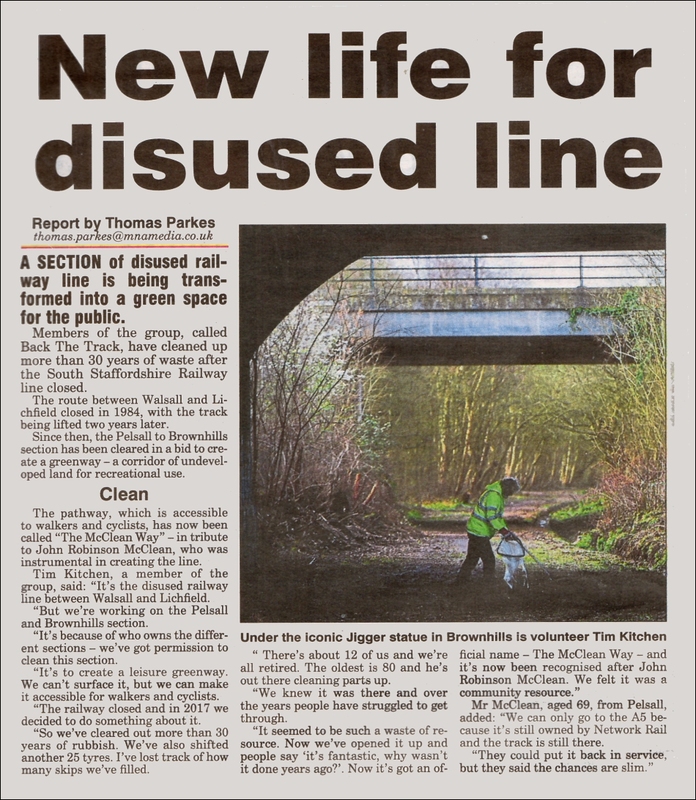 The press came and we made the front page of the Express and Star - again! 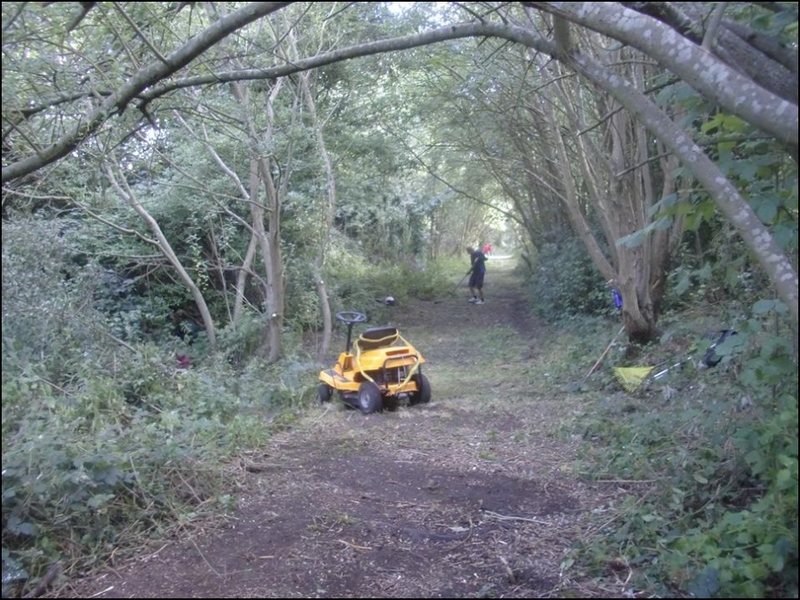 Clearing access to the gates needed for the skip ready for the litter pick under the island. 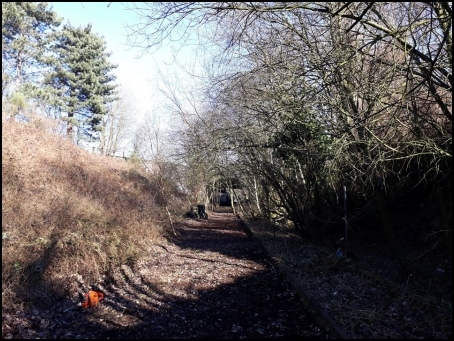 We went out with Sim again this time to place five baited tunnels along the track towards Brownhills. After a week, checking every day, the final results were inconclusive. We'll try again in the spring. 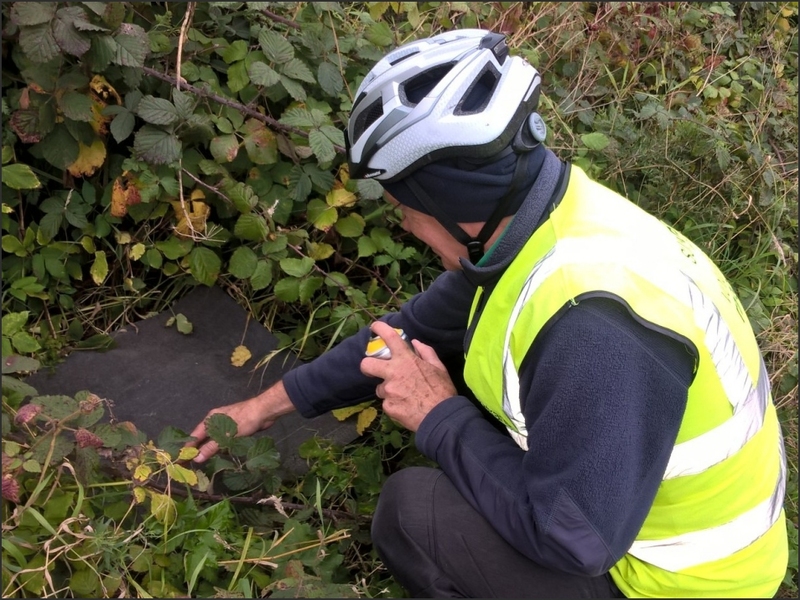 Out with Sim Duhra, Greener Greenways Project Officer (Midlands & East), placing mats along the route to attract reptiles to go under them. After three weeks the result was unfortunately, nothing. We'll try again in the spring. 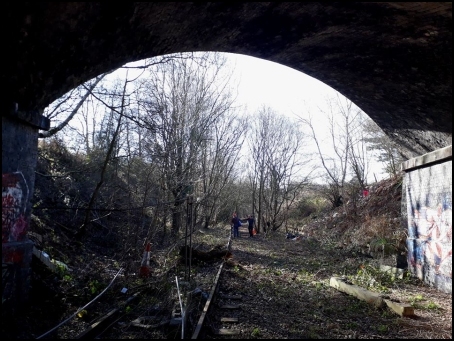 With 2017 being the 170th anniversary of the opening first part of the line it would be great to add something really positive but the quotes for clearing under the bridge are coming in really high, almost as if they didn't want the job! 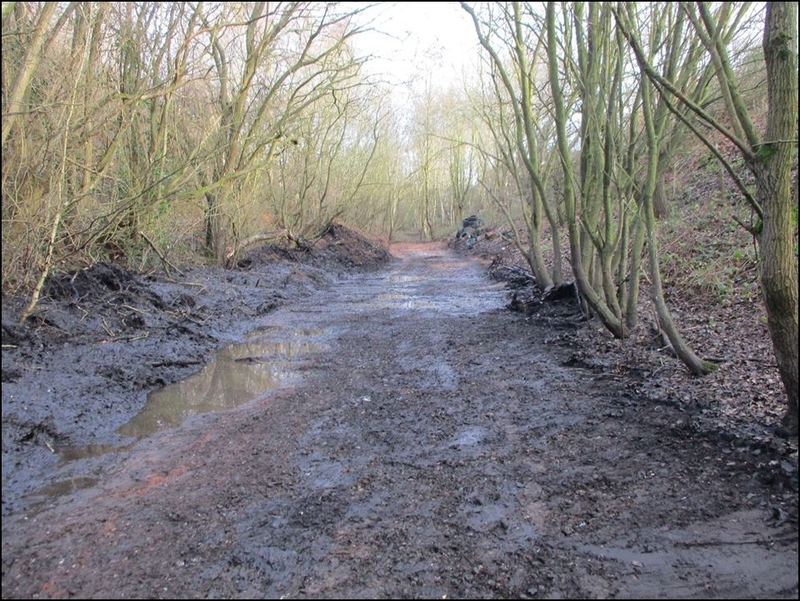 We met up with contractors to investigate the track under the miner in Brownhills. It's a bigger job than we thought as so many health and safety rules apply. 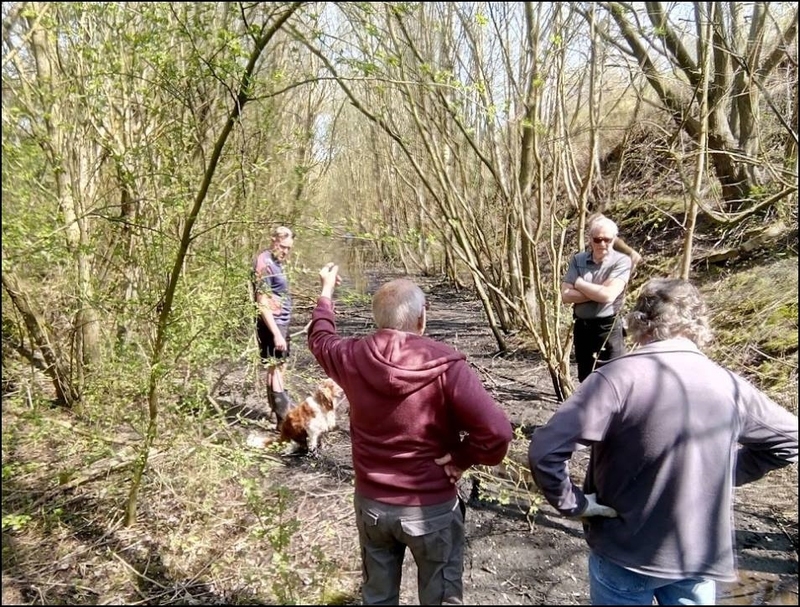 Apparently because there is a couple of inches of water anyone working in it has to be roped to someone standing on dry land plus the danger from sharp objects etc. We are awaiting quotes! 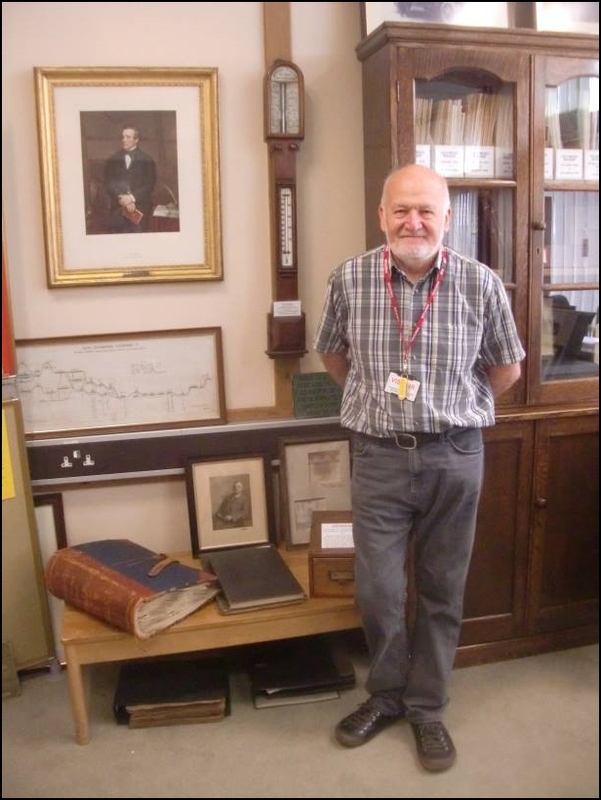 We visited the South Staffs Water Archives where Chris Pattison showed us photos and documents relating to the Lichfield to Walsall pipeline laid alongside the track. It was fascinating material and we are certainly going to take up Chris's offer of a return visit. 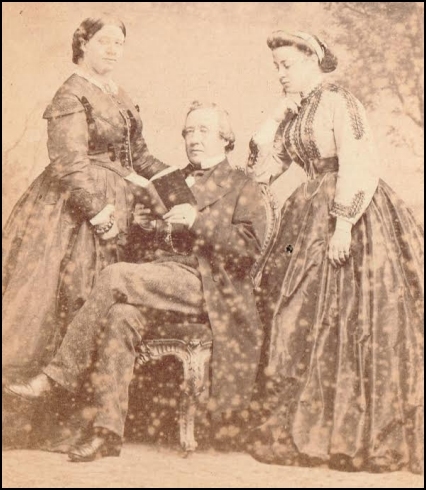 He has also said we can show some of the photo so watch this space. 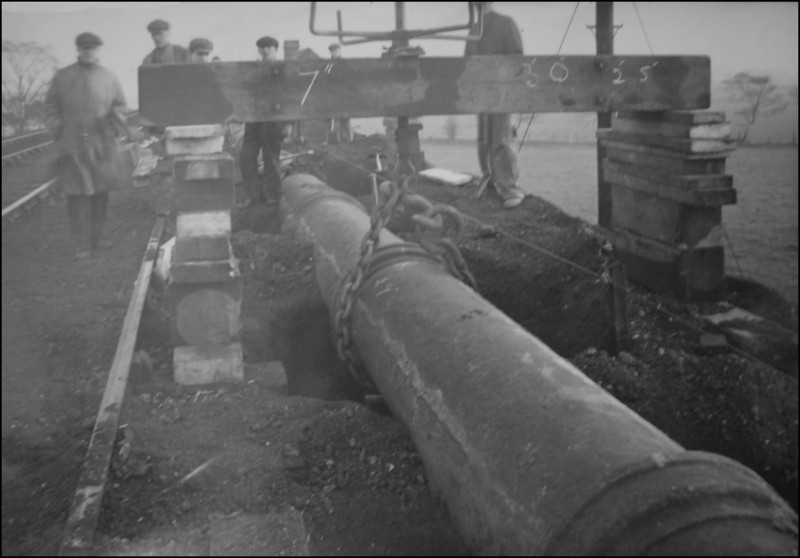 Working on the cast iron pipe at Highbridge Bridge. Health and safety, what's that? Spotted this on eBay and couldn't resist. 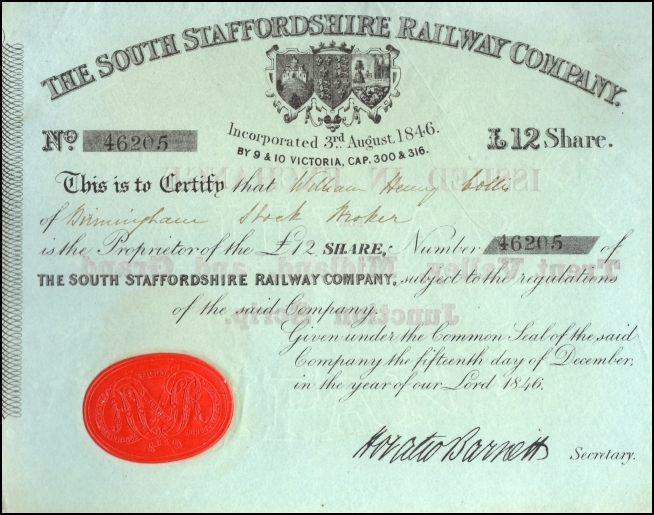 Chasewater Railway has the one after. 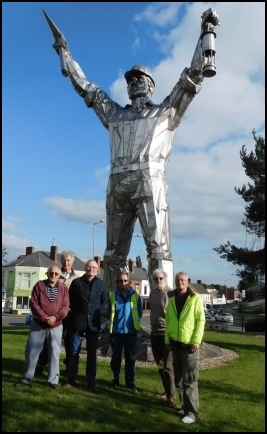 We've now joined up with One Walsall who support community groups and we have been talking to Russell of Aldridge Cinema about appearing on the 'silver screen' while we wait for permission to work on the track to arrive in writing as promised this week. 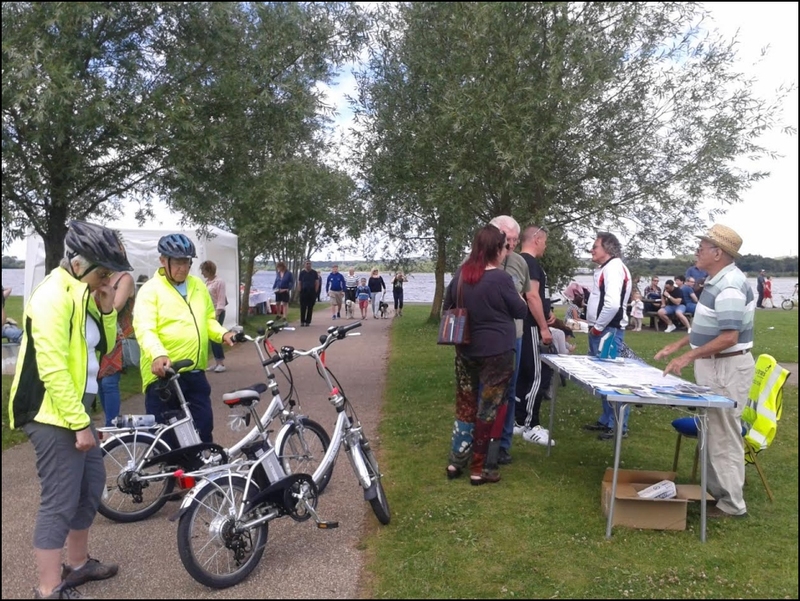 We were invited to set up a stall at the Chasewater Summer Fair on Sunday 2nd. We were lucky in that the weather was fine although a little breezy off the lake but then again you can't have everything. There were visitors to the stand all day and we've added many more followers on Facebook and Twitter. 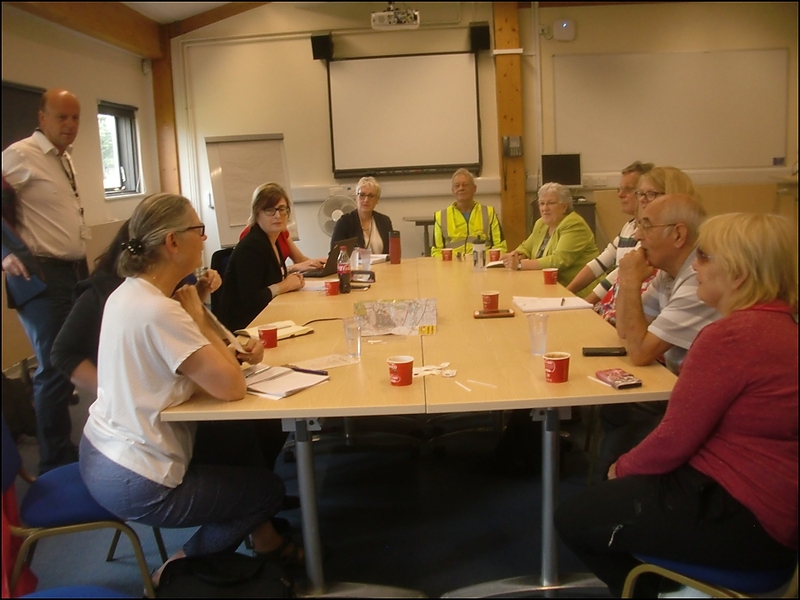 As part of our linking up with others with similar aims in mind we were invited to visit the Sandfields Pumping Station in Lichfield. A fascinating tour of a wonderful piece of Victorian engineering. Thank you Kate and Gill. 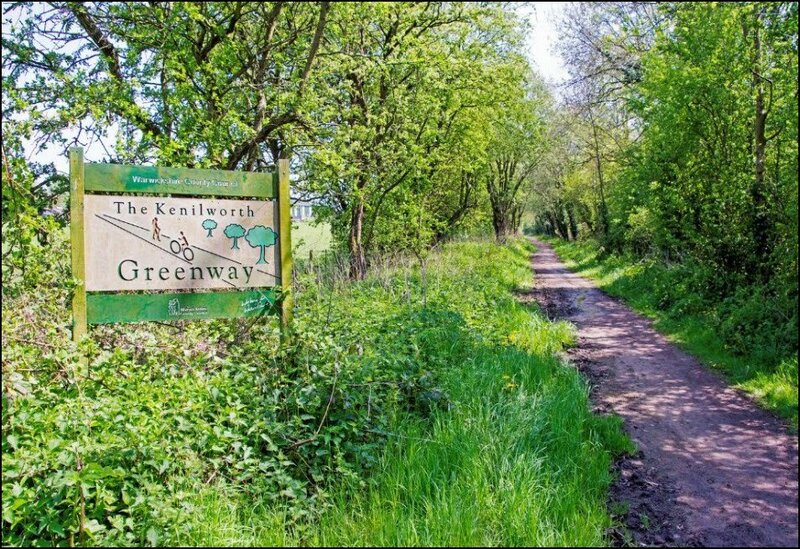 Gill mentioned they'd like to set up a tea room and as you can see below the track is literally on the doorstep, as in our photo looking out of the window, so it would be a welcome end to an outing. 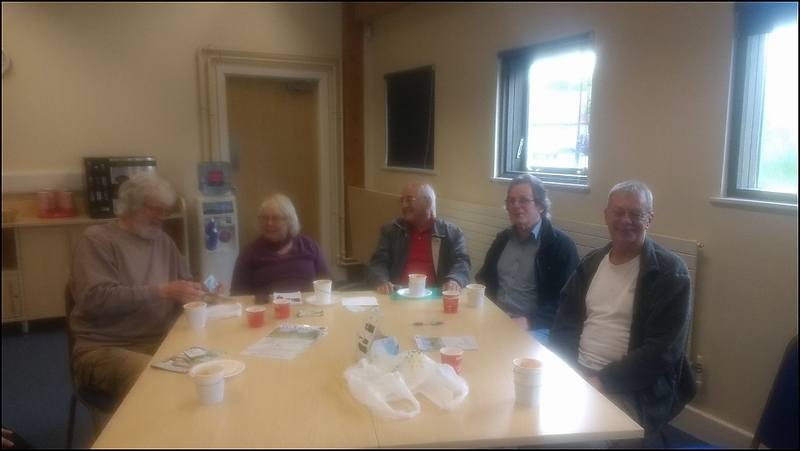 We have just participated in the Chasewater Soup event organised by Kate and Jane at the Innovation Centre. 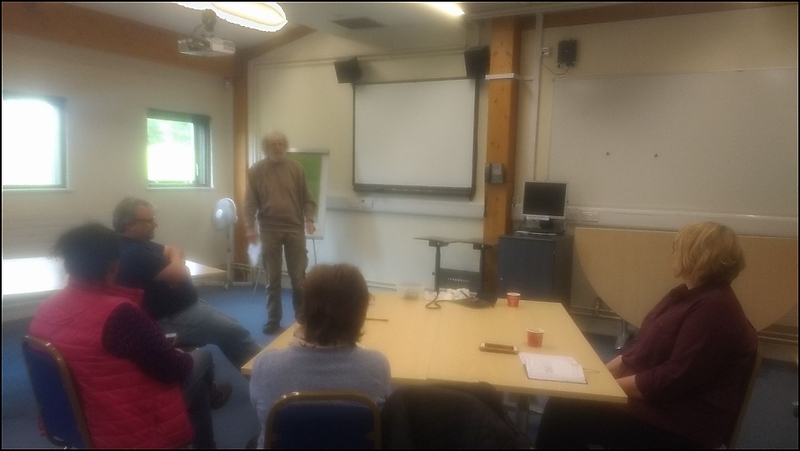 Participants put £5 into a pot and then state why their project should get all the money. Votes were counted while we enjoyed a very tasty soup and although it was close we are very pleased to say we got over 50% of the vote and therefore the money. Now to sort out the insurance. 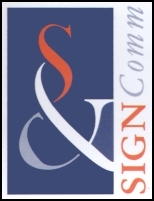 Also a big thanks to Bob for designing and sponsoring the new look business cards. 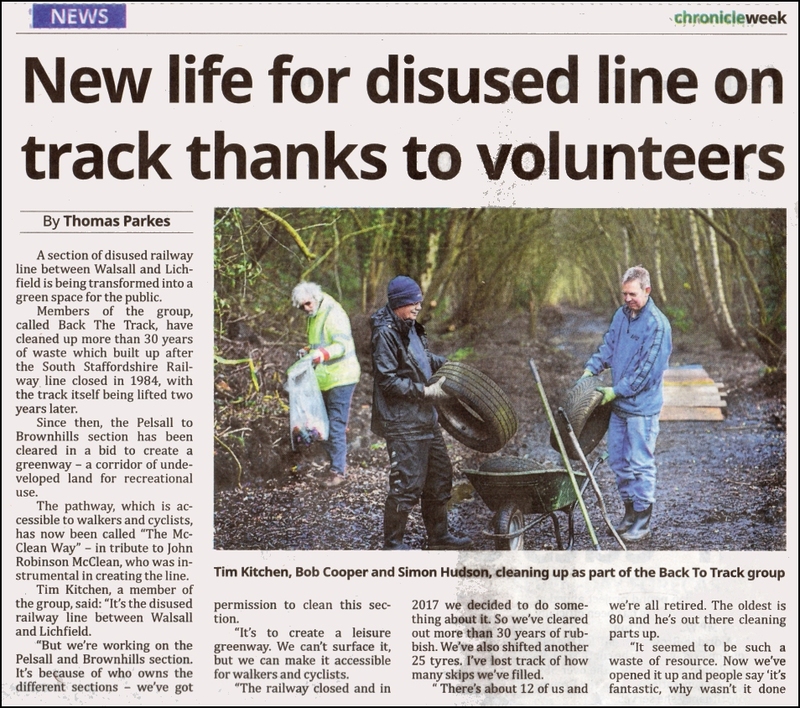 Volunteers spent several months clearing the track as part of the Sustrans 'Greener Greenways' project around Clayhanger to make it easier for walkers to get through. 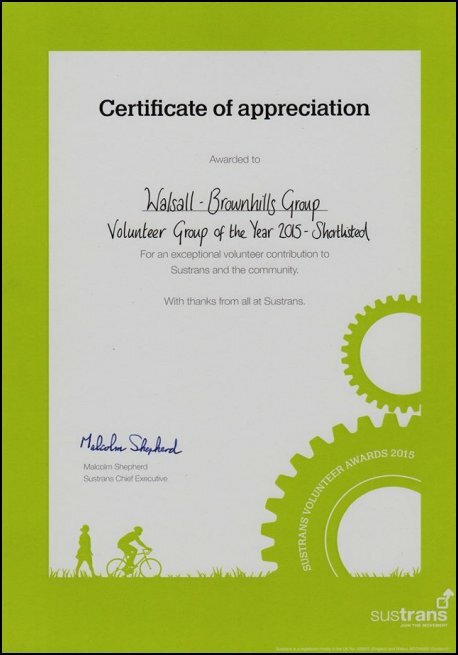 We were thanked and given this certificate. 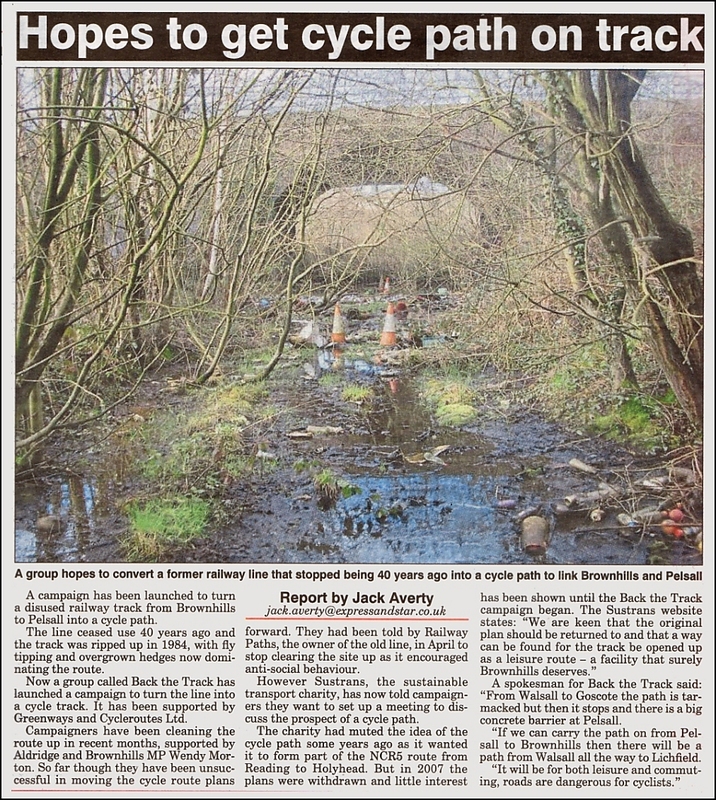 An example where SUSTRANS are working with a group on a very similar project to ours. 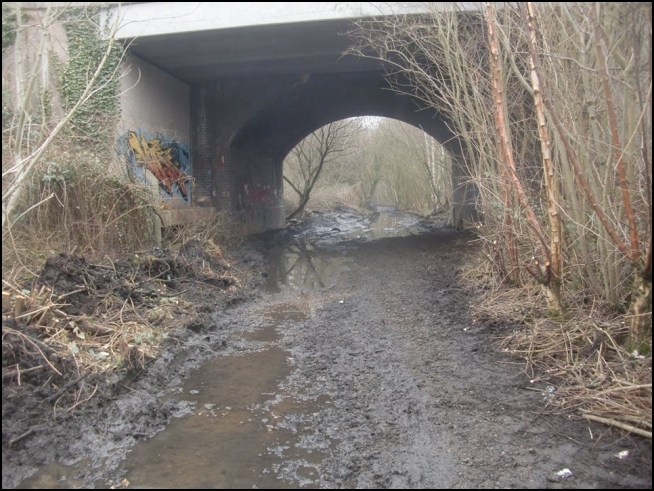 We hope to tidy up the disgusting mess under the traffic island bridges in Brownhills. 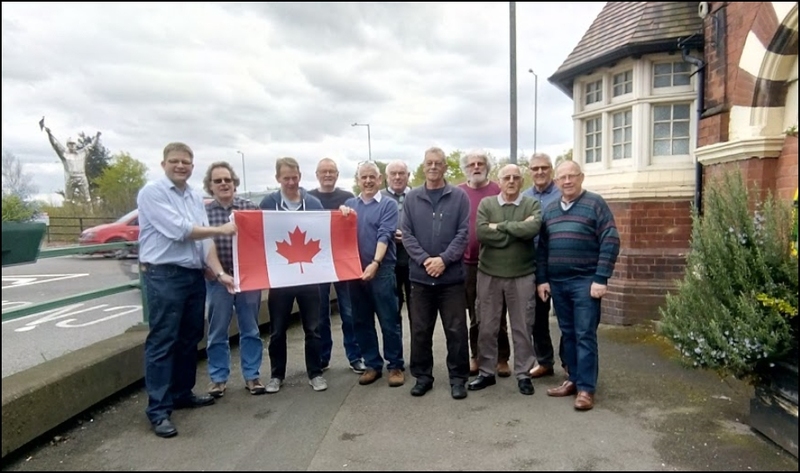 Campaigners thanking Aldridge/Brownhills MP Wendy Morton for meeting them at Ryders Mere. 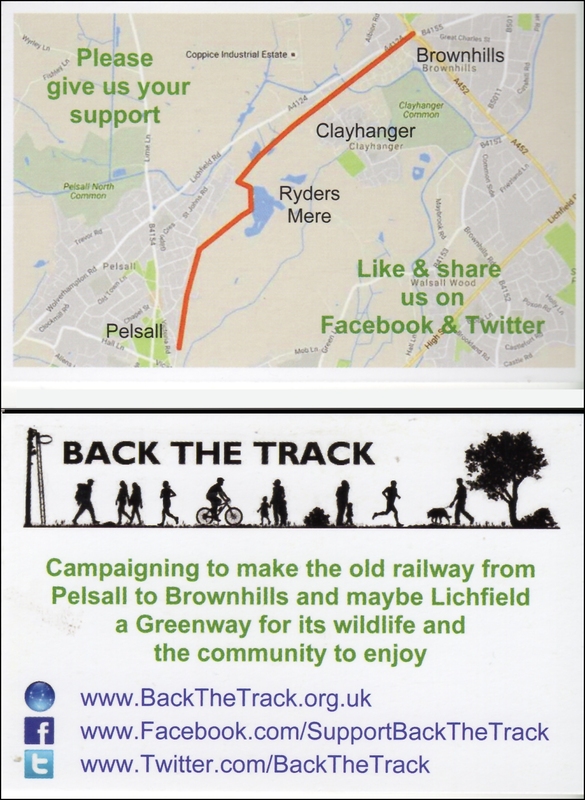 They explained how it would be possible to include this as one of a number of fantastic wildlife attractions if the Pelsall to Brownhills track were to be opened up. 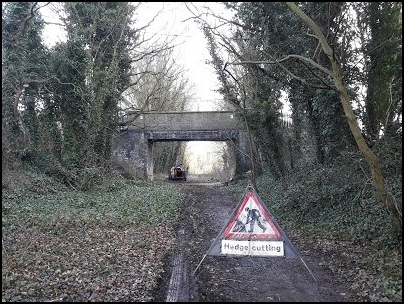 Over the last few days a couple of gentlemen have been spotted checking the infrastructure of the bridges along the old railway track from the canal bridge at Clayhanger down to Rushall. 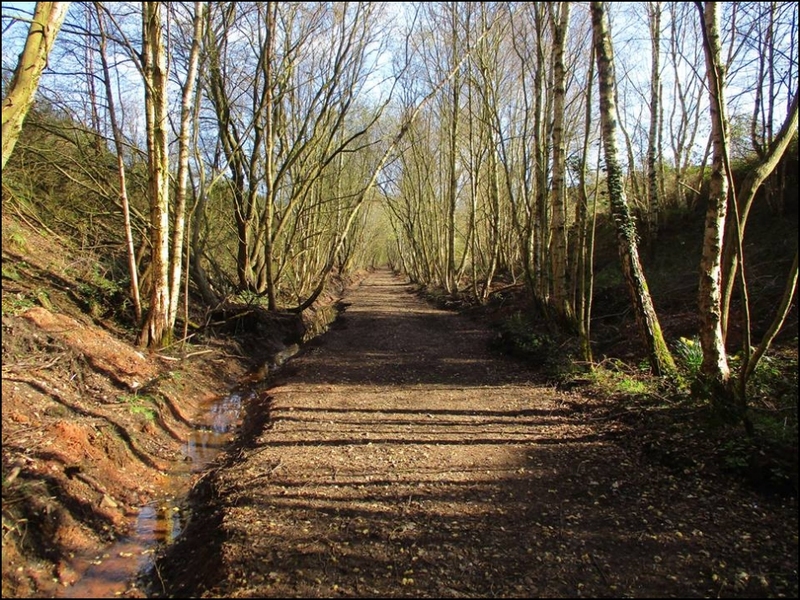 They have been accosted by several campaigners and have been found to be very positive in their attitude to the track being made accessible for walkers and cyclists again. I caught up with them today and had a pleasant chat with Paul Thomas BSc MSc, Bridge Engineer and John Litt, Bridge Inspection Assistant of Railway Paths Ltd. On leaving Paul said he was happy for me to quote him when saying "I predict a happy outcome for all very soon" Fingers crossed as pruning and tidying work needs to recommence on the track before nature takes it all back again. 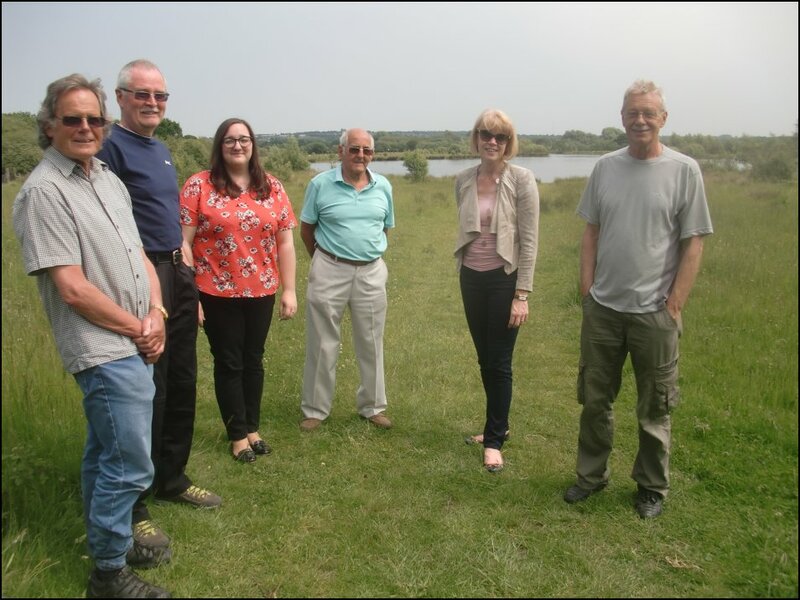 Local MP Wendy Morton meeting with Network Rail who say they have no objection to the track being made into a Greenway. 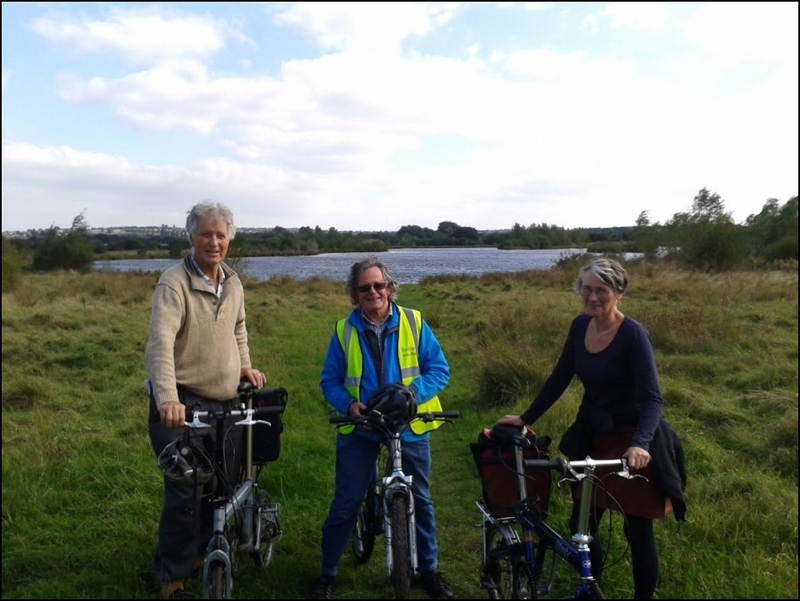 John Grimshaw and Caroline from Greenways and Cycleroutes Ltd stopping off to look at Ryders Mere. 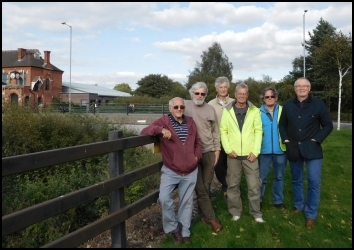 Dennis and Bob gave them a tour before we all met up in Brownhills to look at what needs to be done. 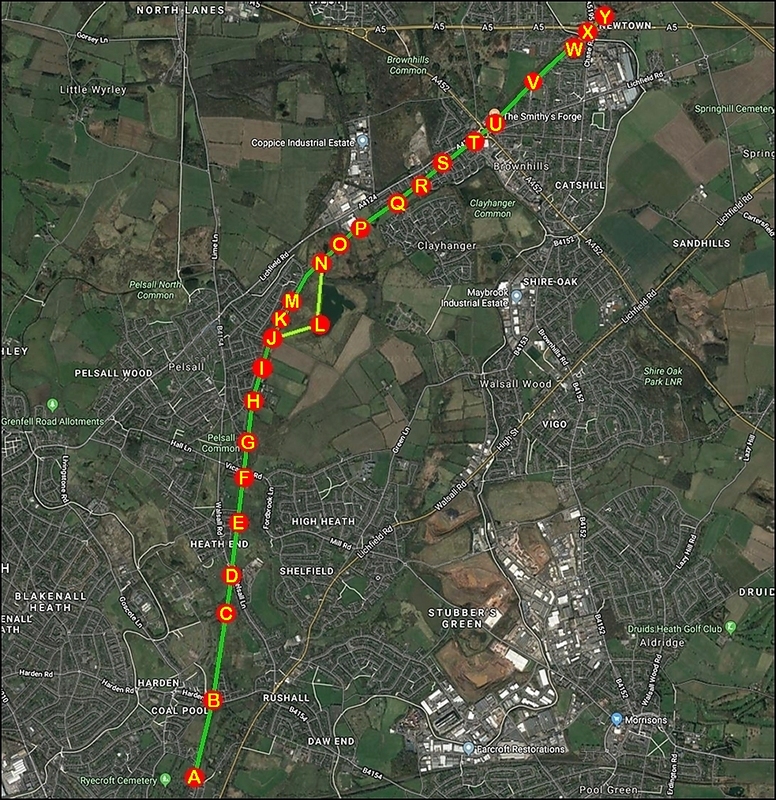 We know he has surveyed the route from Lichfield to the A5 at Brownhills so it wouldn’t be too much more to ask to just join it up with the existing route at Pelsall would it or are we being too optimistic? A good article using our picture and a quote from our site. 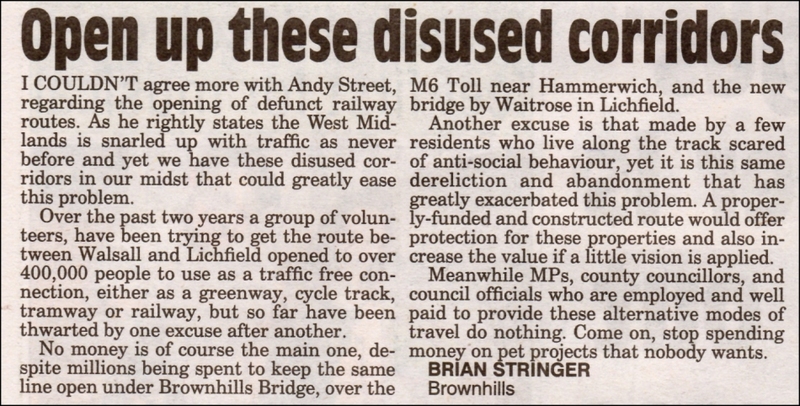 Unfortunately it has been attributed to SUSTRANS! 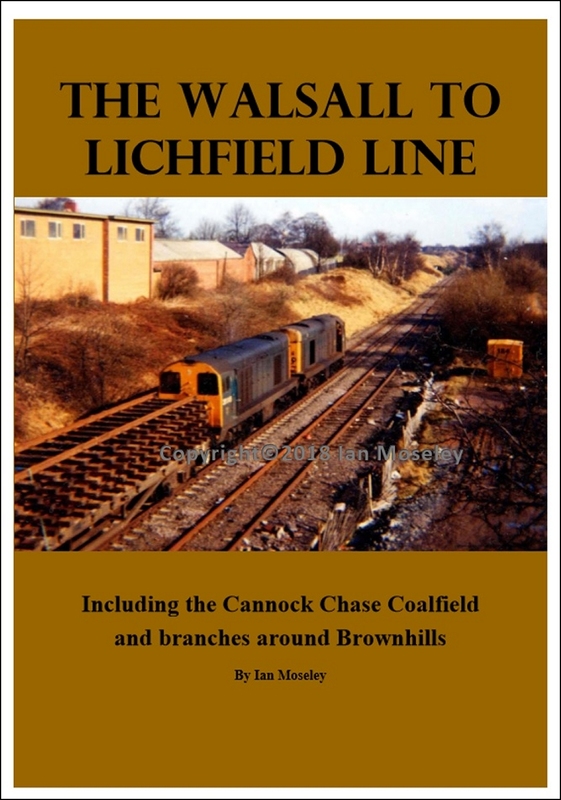 Thanks to Brownhills Bob's Website and Brian Stringer who was editor of this journal. 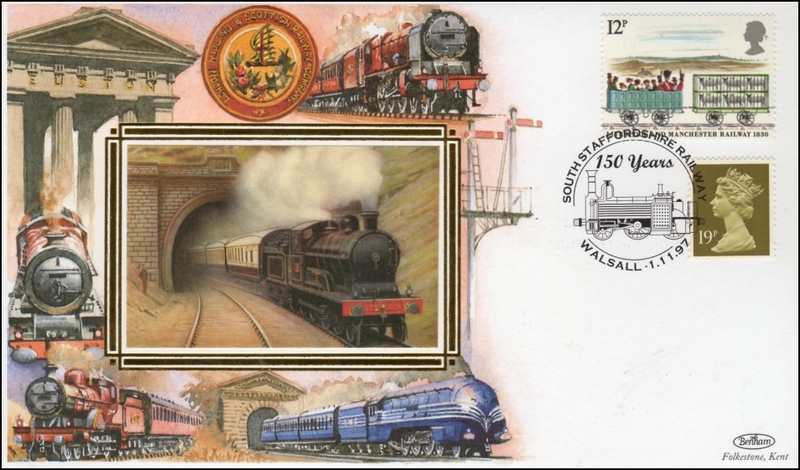 Ever since the day the railway closed there has been talk of it reopening at some time in the future. 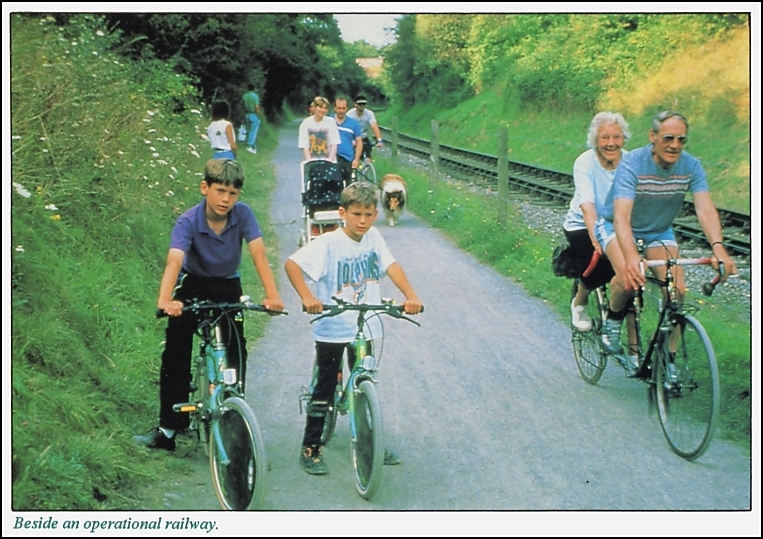 If it was made into a cycle track then what would happen if the railway came back?. 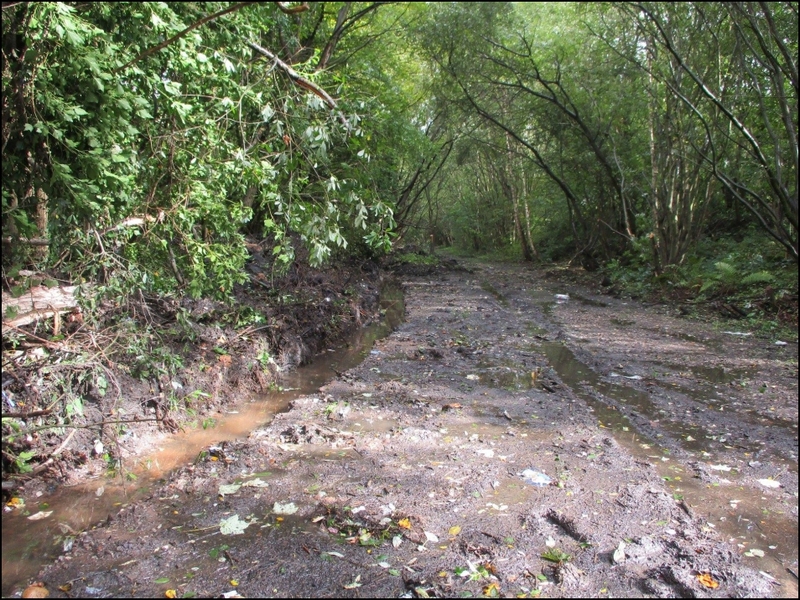 The above photo shows the Bath to Bristol Cycleway. It seems to be following a familiar route. 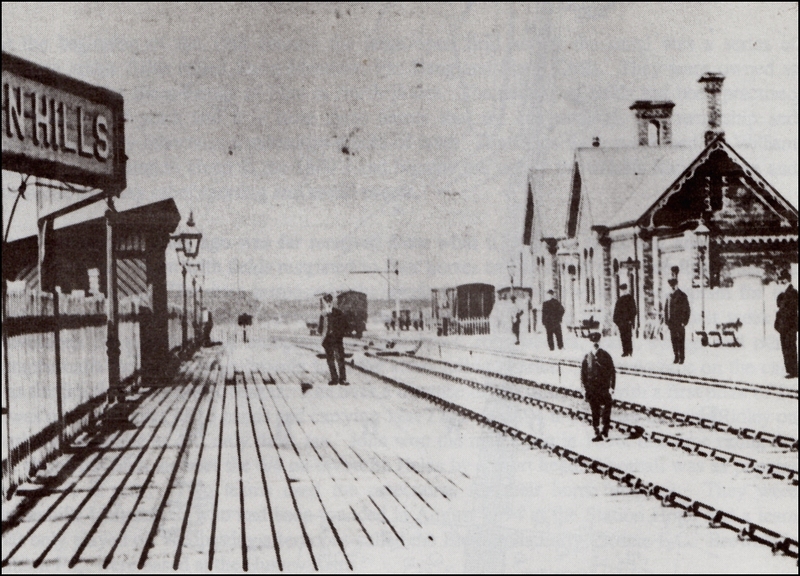 Another answer to the question "But what if the railway came back?" Here a solution is clearly shown in Ireland where again they have proved that the two do not have to be mutually exclusive. 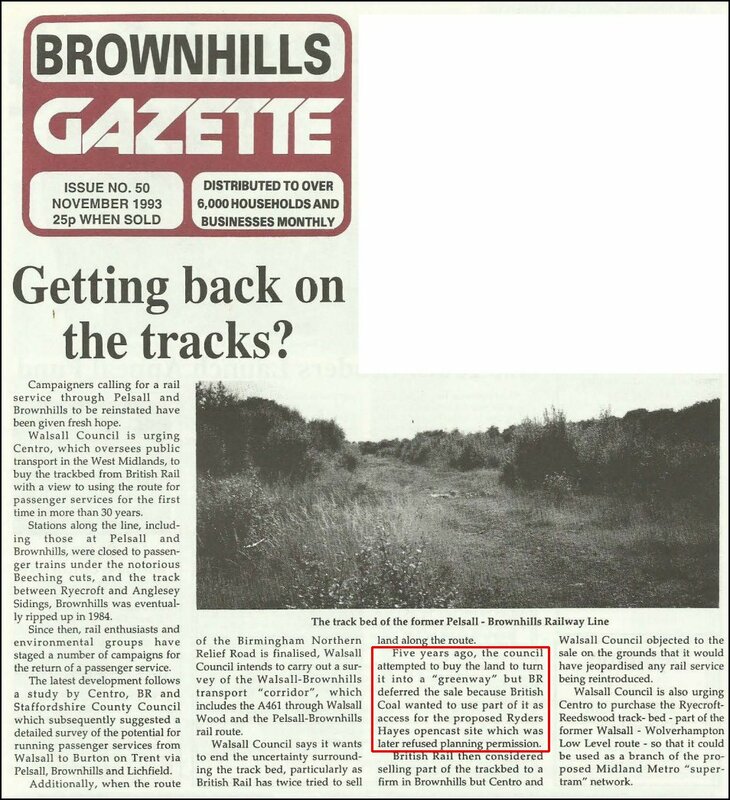 We are keen that the original plan should be returned to and that a way can be found for the track be opened up as a leisure route - a facility that surely Brownhills deserves!